It all starts today at the times below! 11:56AM It's like our own little keynote send off! 11:55AM And that's all she wrote! Thanks for reading, and thanks to Justin Glow, Dan Chilton, and the Blogsmith and Netops teams for keeping us afloat! 11:55AM "And all the rest of the family that just supports us in a thousand ways... awesome job. So this our new baby, I hope you love it as much as we do. Thank you very much." 11:53AM "I urge you to get your hands on one of these and see it for yourself. I just want to say thanks to the teams that have worked their tails off to create these products." We think we know where this is going. 11:53AM "I put up this slide a little earlier this year. 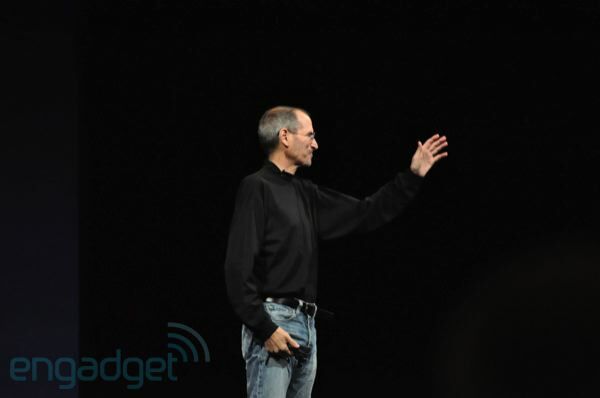 It represents what Apple is all about. We're not just a tech company. 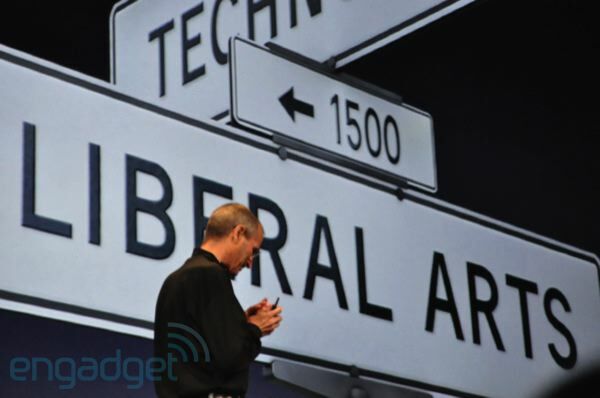 Apple is more than that. It's tech and humanity. It's the hardware and the software working together. 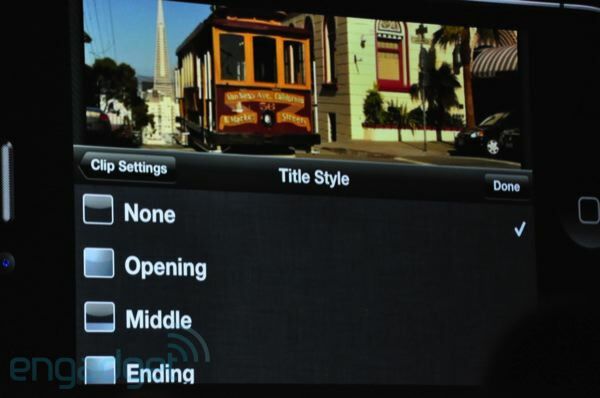 It's not just a great new camera system, it's the editing too, it's not just a front-facing camera, it's that plus 18 months of work on the software side. 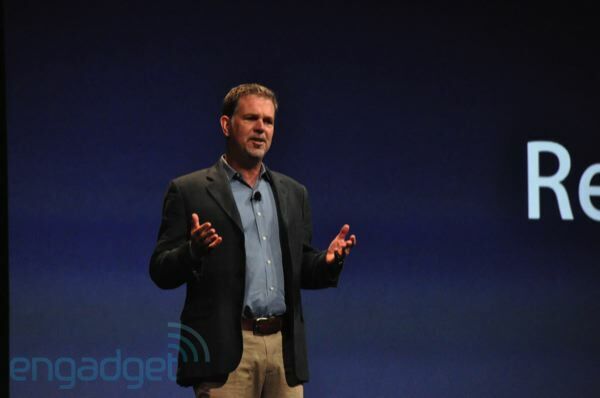 It's the complete solution, so all of us don't have to be system integrators." 11:51AM "This is going to change everything... all over again." 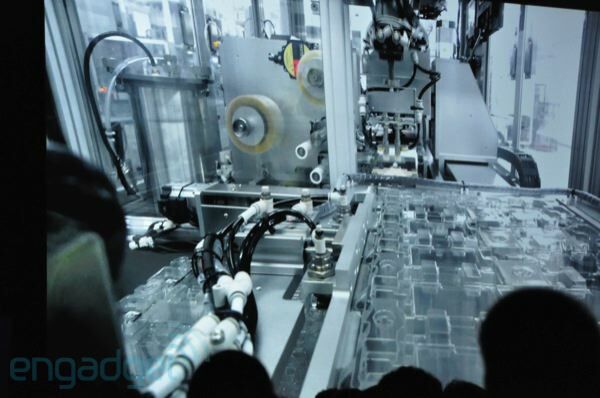 11:50AM "We developed a glass that's 30 times harder than plastic." 11:49AM And now... the A4 part! 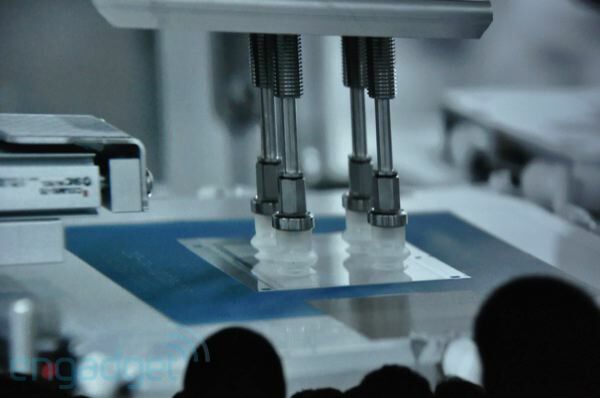 11:49AM They've shown how the casing is produced. 11:49AM Gotta admit, this video is making this thing look extremely attractive. 11:47AM "I can't believe this is real. That this is actually happening." 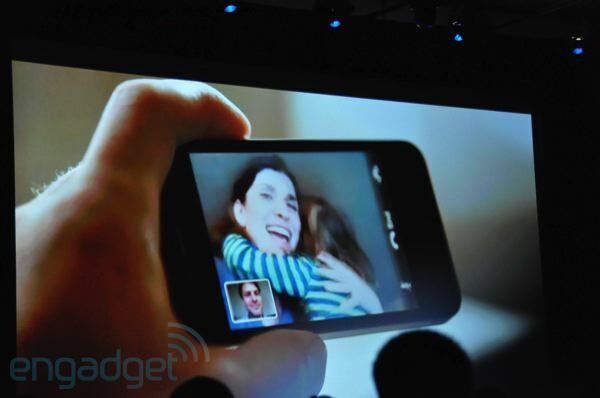 Hey people using video chat over 3G all over the world -- does it feel that way? 11:46AM Joswiak: "FaceTime is going to change the way we communicate forever." Forever? Forever ever? 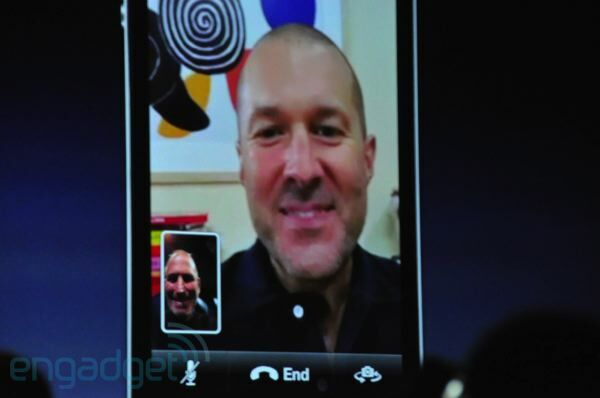 11:45AM Ah... Jony Ive is pontificating! "This is so much more than just another product." 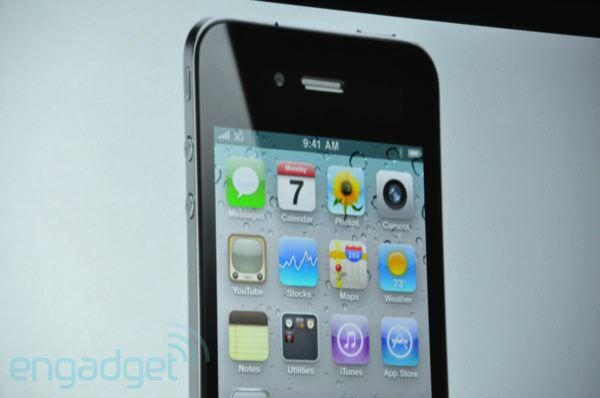 11:45AM "So that is iPhone 4 and iOS 4. We have a video." 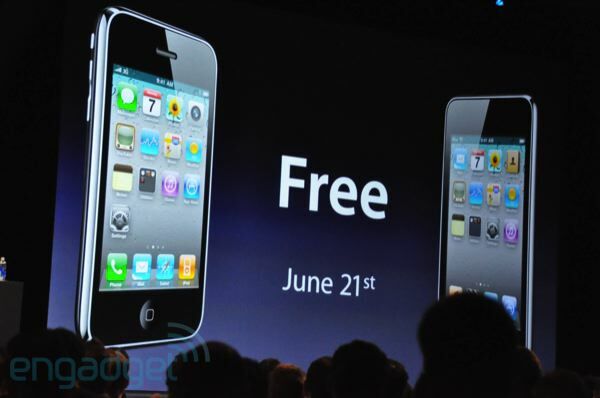 11:45AM "We finally found a way to get them for free to our iPod touch users." 11:44AM "And they come in colors... those are $29. 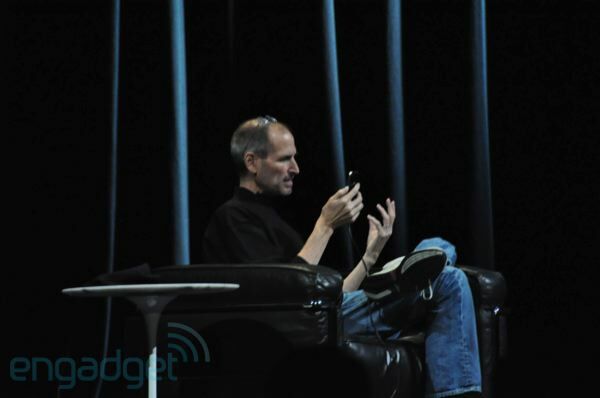 And I'd like to talk for minute about iOS 4 upgrades. 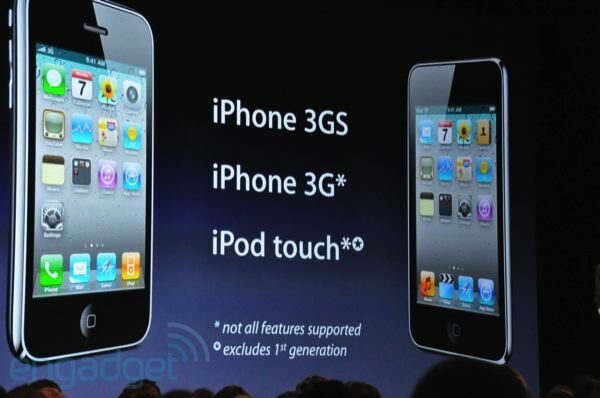 For the 3G, not all the features are supported, same with the iPod touch, and this excludes the first generation. 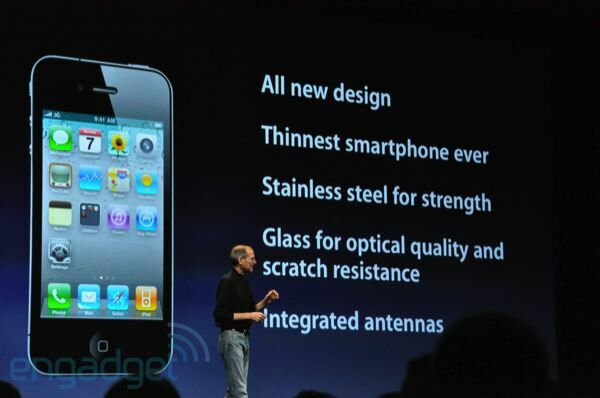 Upgrades are free for all these products." 11:43AM "Now there's some accessories. A Dock. We have a case -- we call it a Bumper." 11:42AM "Pre-orders start a week from tomorrow. And we're shipping in 5 countries. 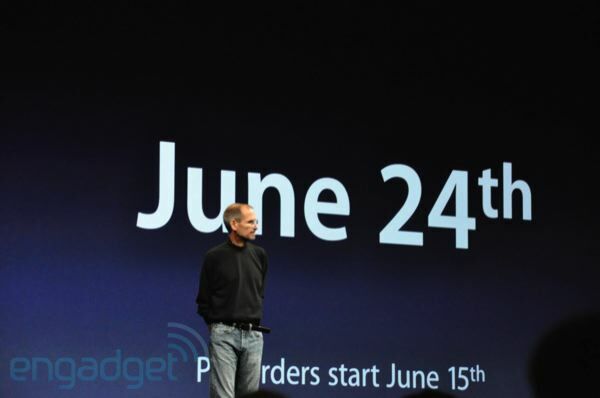 In July we're shipping in 18 more." 11:42AM "So what's our lineup look like? 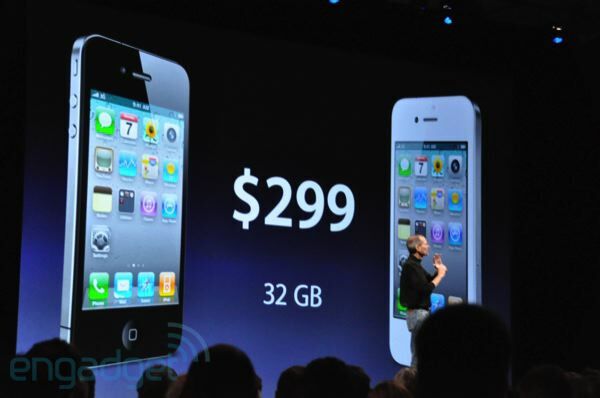 3GS is now $99. These go on sale June 24th." 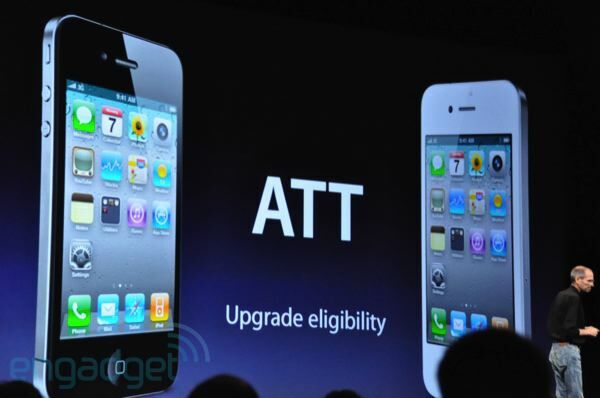 11:41AM "AT&T is going to make an incredibly generous upgrade offer. 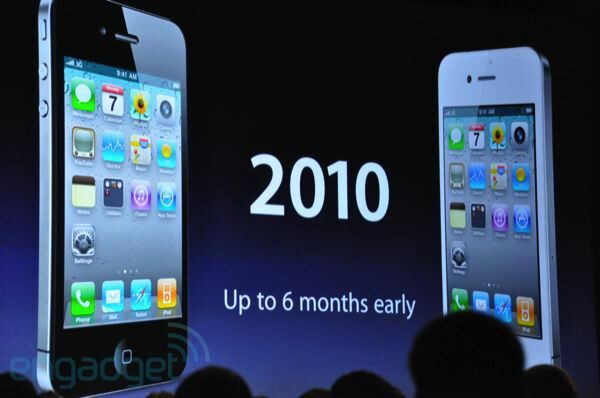 If your contract expires at any time in 2010, you can upgrade to the iPhone 4. 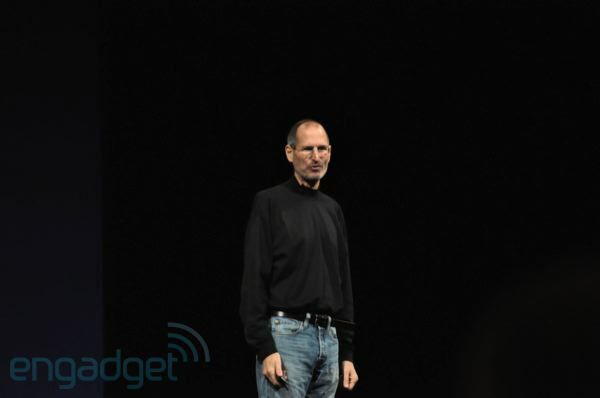 You can get it up to six months early." 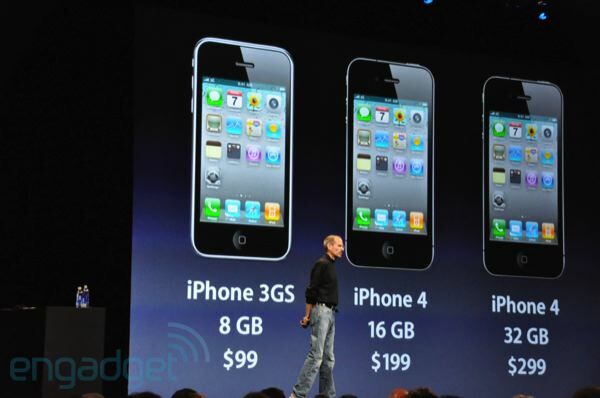 11:41AM "Pricing -- there's two colors. White and black. 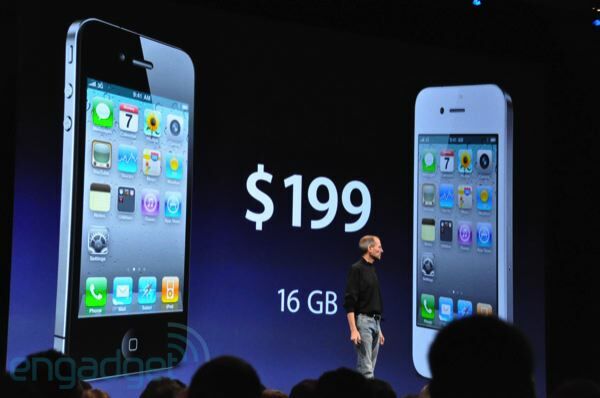 Pricing -- $199 for 16GB, $299 for 32GB." 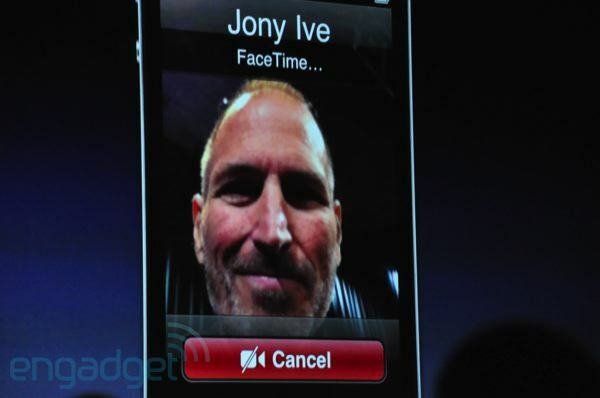 11:40AM "So FaceTime... that's number 9. 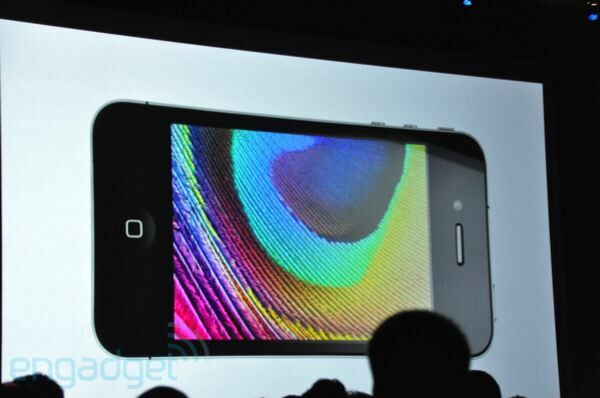 So that is the iPhone 4. 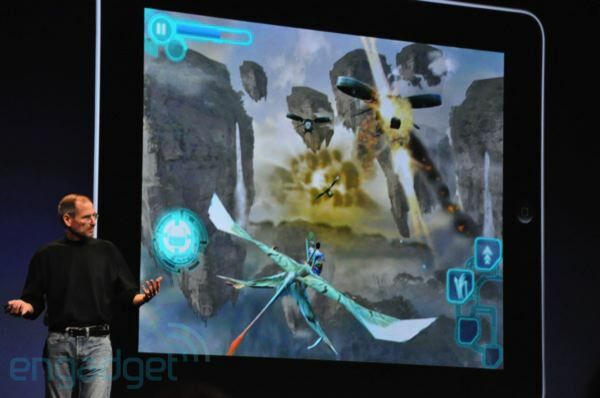 We think it's the biggest leap we've taken since the original." 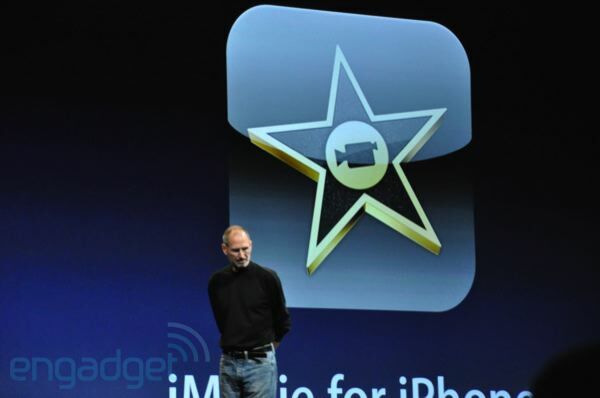 11:39AM "Now it's based on a handful of standards... but this is going to be an open industry standard." 11:39AM "This is one of the moments that reminds us of why we do what we do." 11:38AM Wow -- very cool. Two people speaking in sign language on the phone. We're getting a little choked up! That's a pretty cool use. 11:38AM Wow. 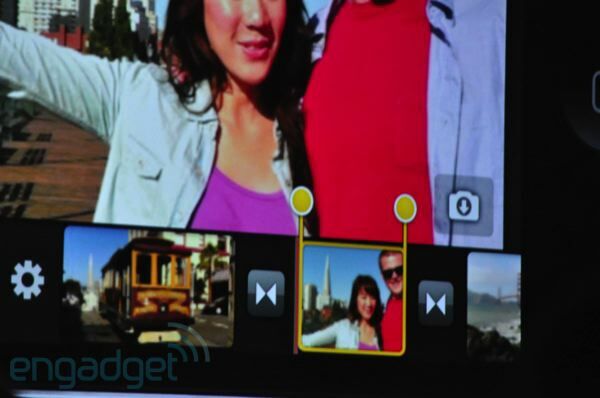 You can flip the image to the rear camera. This commercial is pretty intense. 11:37AM A daughter graduating and talking to her mother! 11:37AM Ah ha... it's the Sam Mendes commercial! Update: Though the commercial was similar to the Sam Mendes spots we'd heard about, it was apparently directed by Andrew Zuckerman. 11:37AM "We made a little video to show some of the ways people might use it." 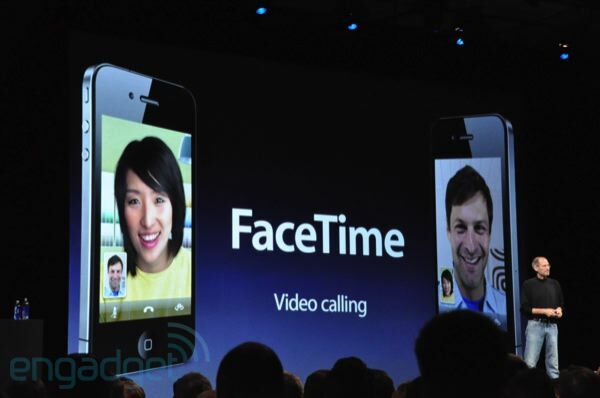 11:36AM "So FaceTime video calling. We're really happy with this." 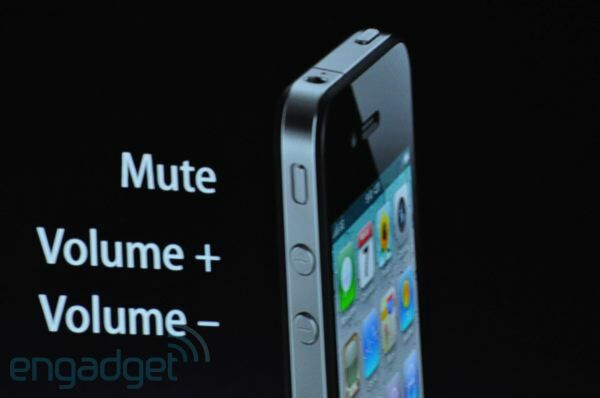 11:36AM "The video and audio quality is great. 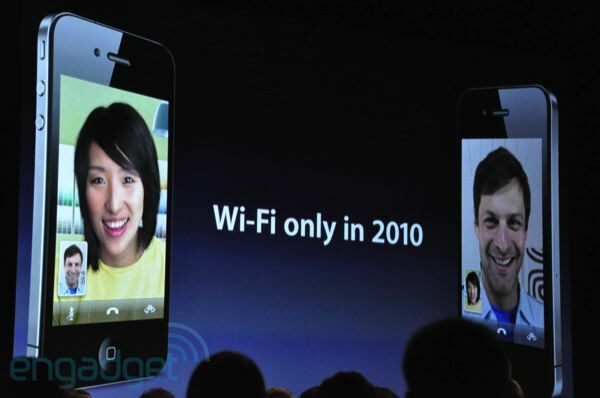 Now it's going to be WiFi only in 2010. We need to work a little bit with the carriers..."
11:35AM It's called FaceTime. WiFi only. 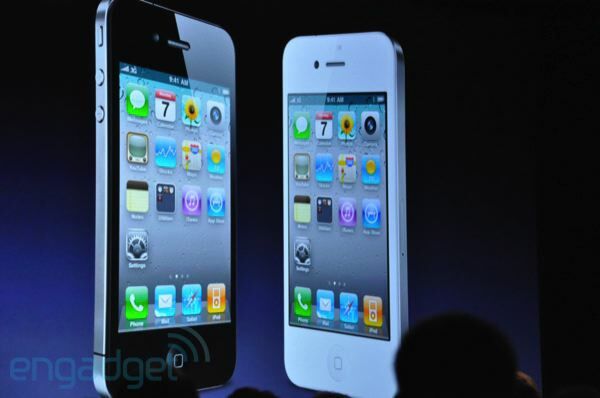 iPhone 4 to iPhone 4. No setup. 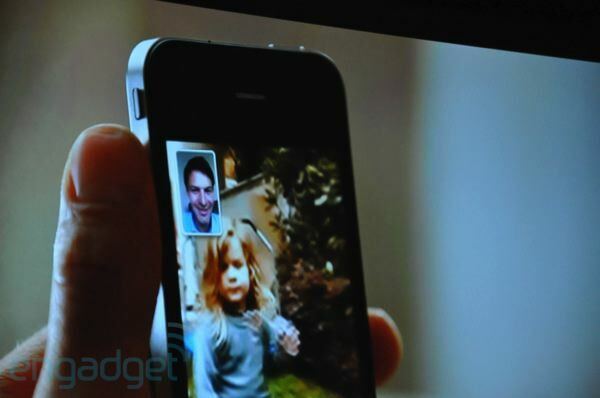 11:35AM "You know I grew up with the Jetsons... and video calls... and now it's real. What about you?" 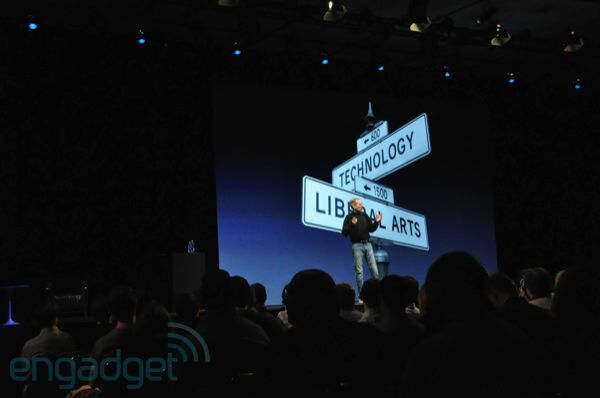 Jony: "I grew up with the same thing, and it's real now!" 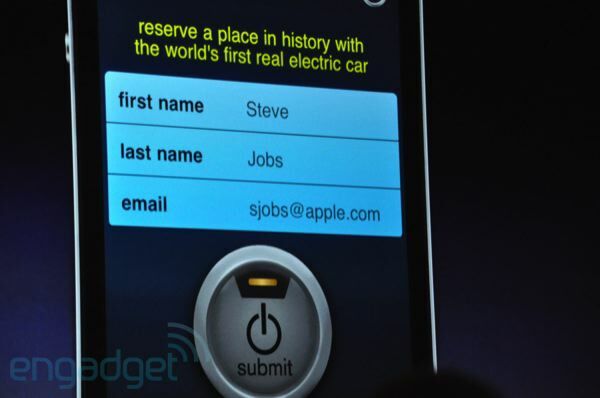 Steve: "It is real... especially when people turn off their WiFi." 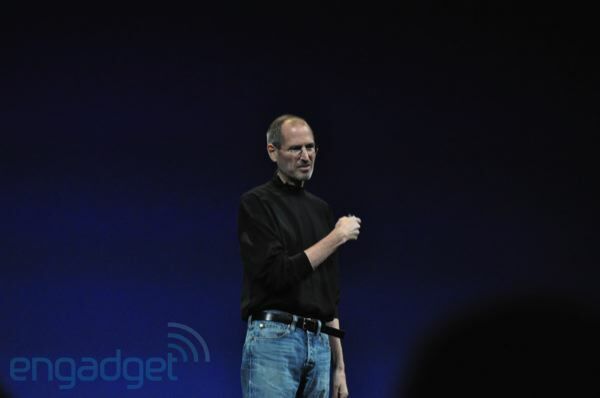 Jony: "We've had to wait an awful long time for this to become reality." Steve: "Okay, let's have lunch soon." 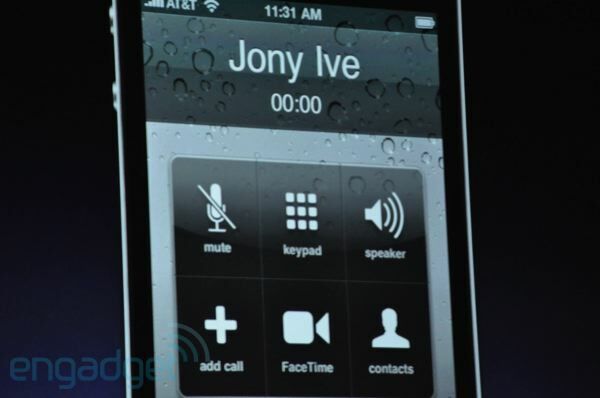 11:33AM "Hi Jony -- how are you?" 11:33AM Whoa it froze up for a second. "Now it never freezes up... did you all turn off your WiFi?" 11:33AM Wow, ha! Jony Picked up! 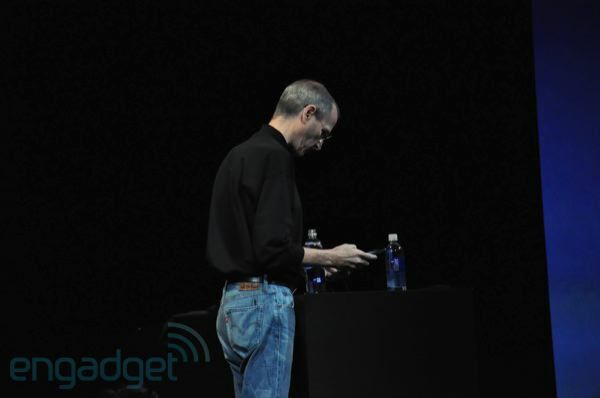 11:32AM "So in 2007 when we launched the iPhone, it was my privilege to make a call to Jony Ive... and I'm going to do the same thing now." 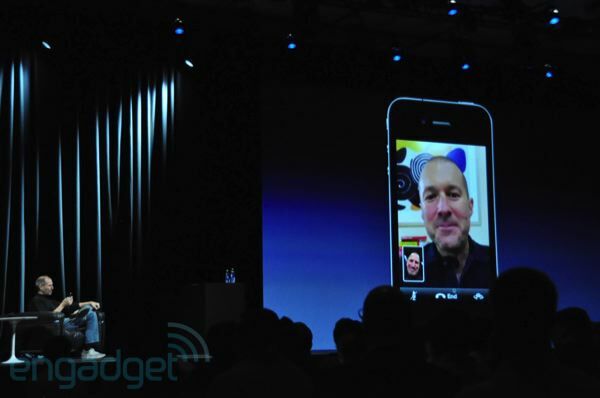 Boom, video call. 11:32AM "We'll, we're really pleased with it. 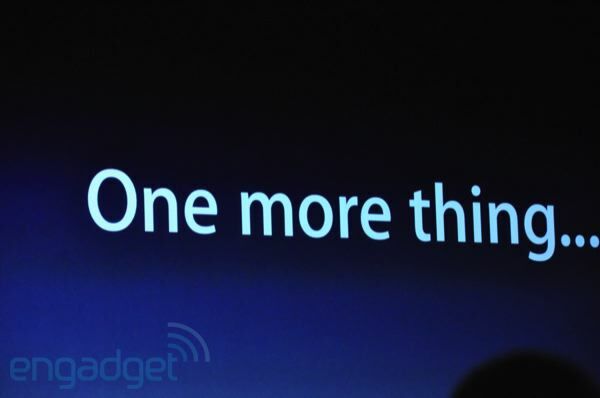 But there is one more thing." Whoa -- the lights just went up along the side of the stage. 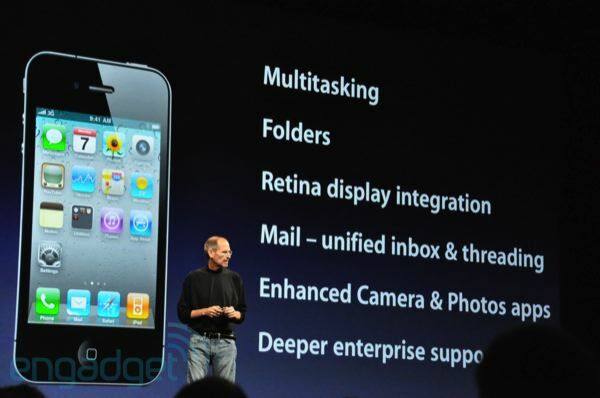 11:31AM "So those are the eight things I wanted to share with you on iPhone 4. What do you think so far? I think it's a lot more than people thought it was. What do you think?" Big cheers. 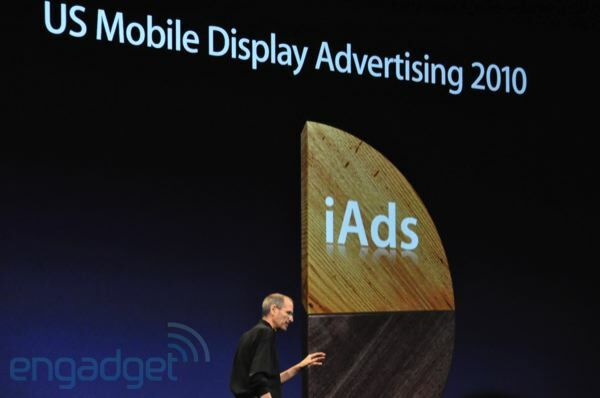 11:30AM Steve says iAds are projected to represent 48% of the mobile advertising market in the second half of 2010. 11:29AM "We've got advertisers committing to $60m." 11:29AM "I think a lot of people are going to try and win the car. It's a great idea! 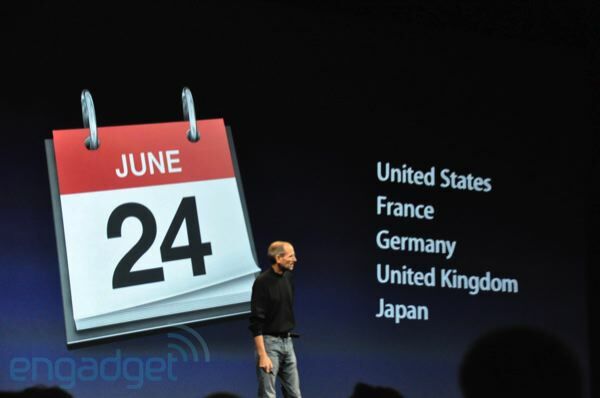 We're going to turn on iAd on July 1st for all iOS 4 devices." 11:29AM "So that is iAd." 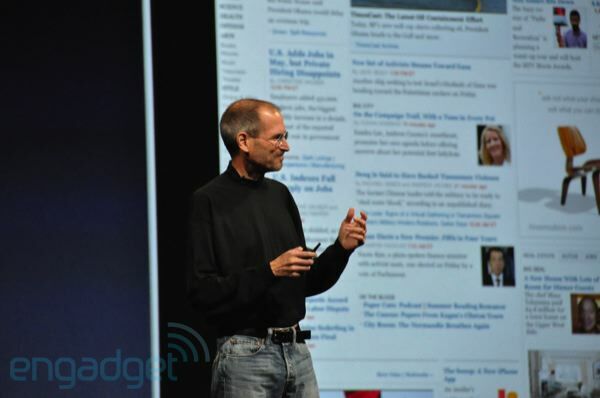 11:28AM Steve is showing off interactivity with ads. 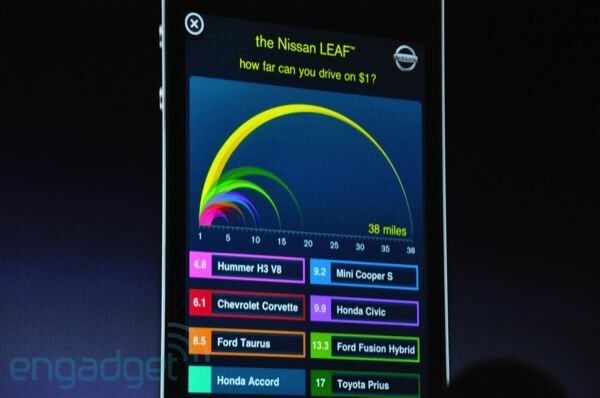 Pretty cool, if you want to interact with a car ad. 11:27AM "So now we've got this cool navigator on the bottom. It spins the car. 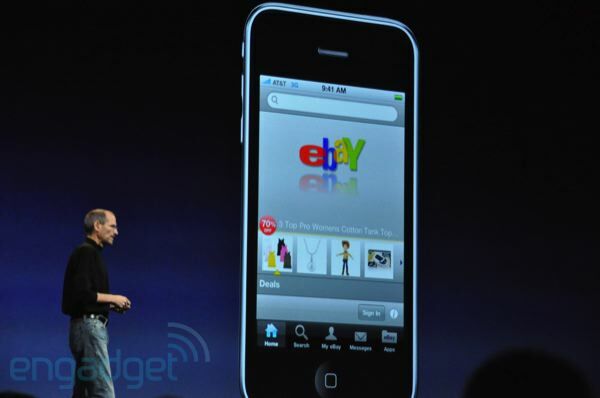 The only way you'll be able to get one of these is through this ad on the iPhone. 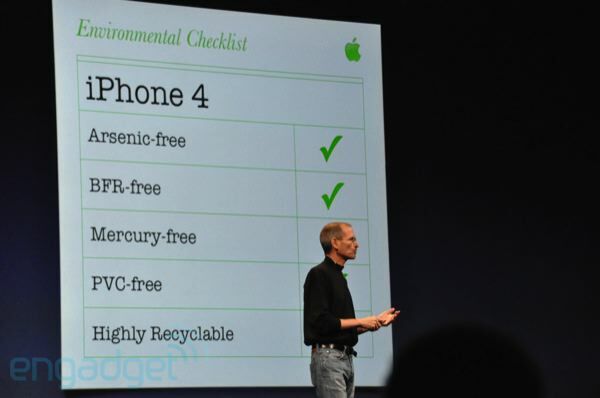 So if you want to get a Leaf you need to get an iPhone..."
11:26AM Wow, actually a pretty amazing ad. If you're a geek, you will love it. 11:26AM "It loads in, and I can always X out of it. So we're loading up a video... and here we go." 11:25AM "I pulled one ad in process which was a Nissan ad. 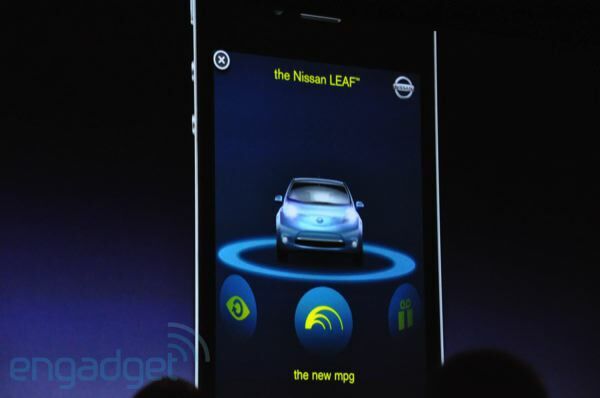 They're going to use it to advertise their electric car, the Leaf. They were hesitant to have me show you, but I convinced them." 11:25AM "So let me tell you some of the brands that will be advertising with us. Nissan, Citi, Unilever, AT&T, Chanel, GE, Liberty Mutual, State Farm, Geico, Campbells, Sears, JC Penny, Target, Best Buy, Direct TV, TBS, and Disney... those are some of the brands." 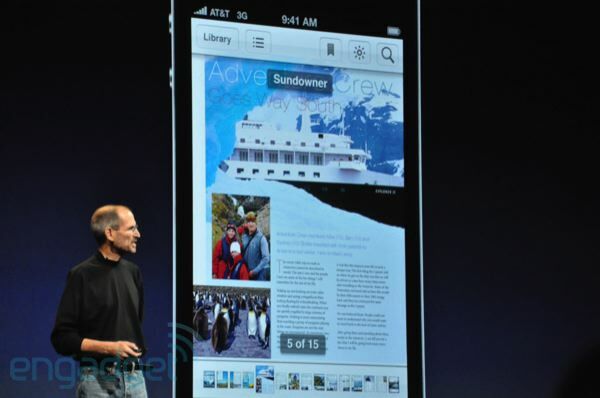 11:22AM Ooh, an iAd demo. 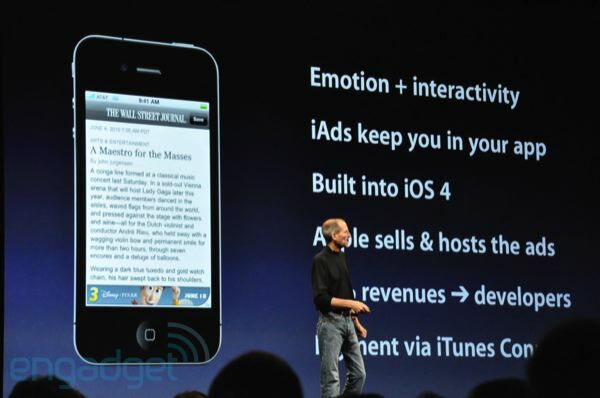 So, iPad, iAd, iOS, iPhone, iPod. Let it sink in people. 11:21AM "And that is number seven. Number eight... iAds. Why are we doing iAds? 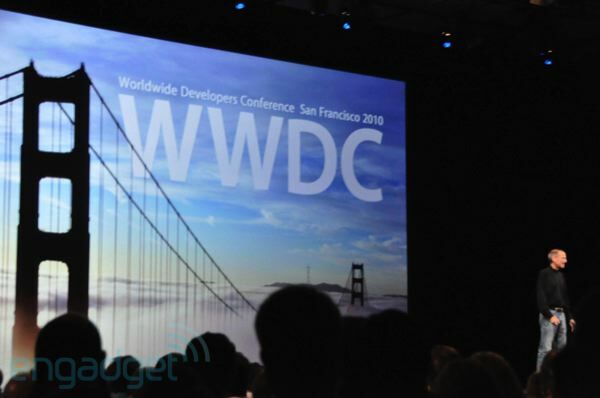 To help our developers earn money." 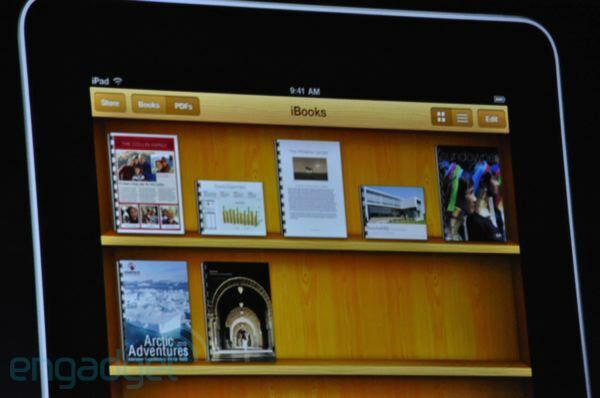 11:21AM "Now, iBooks has the iBookstore, and it joins iTunes and the App Store. 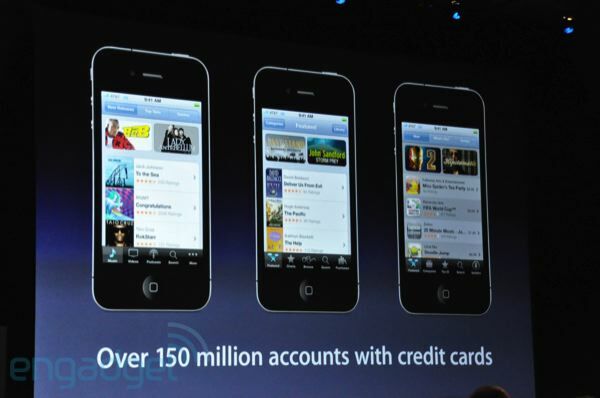 We have 150 million accounts -- we think it's the biggest on the web. We're number one." 11:20AM "It's really really nice. Pretty cool, huh? 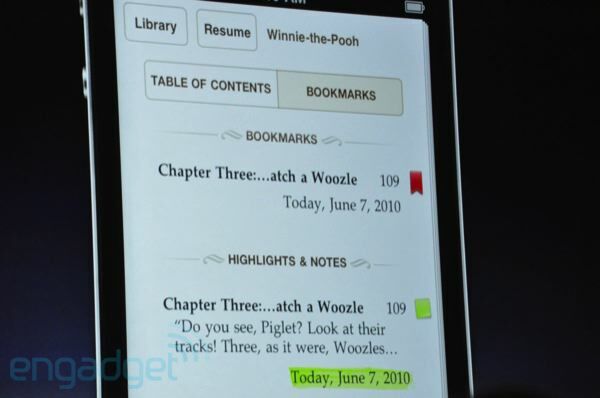 So that is iBooks." 11:19AM The PDF viewer looks pretty full featured. 11:19AM "I can make a note here... 'I love winnie the pooh'"
11:18AM "I'm going to open one of my favorite books... 'Winnie the Pooh'"
11:18AM "It just all works." Demo time! 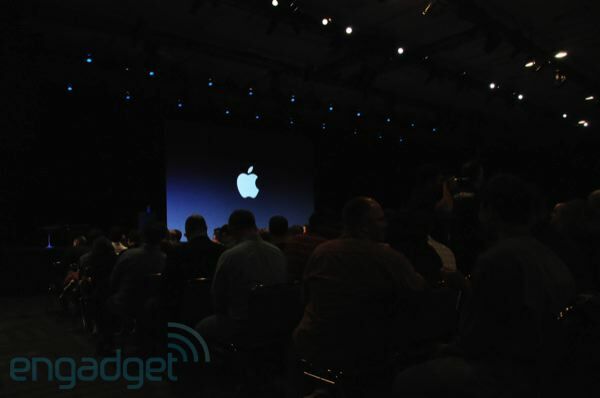 11:17AM "We'll have it on the iPhone, the iPad, and the iPod touch. What can we do with these together? First, you can purchase and download a book. 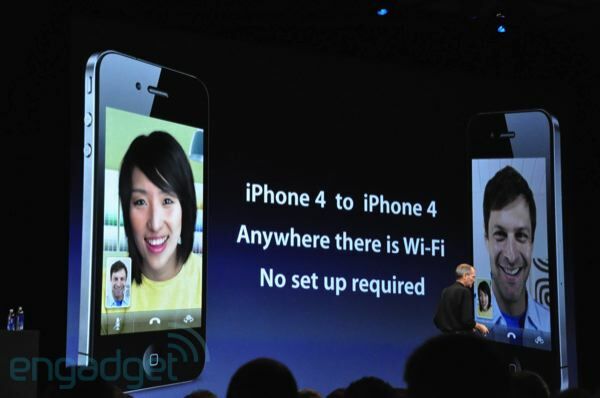 It will download wirelessly. 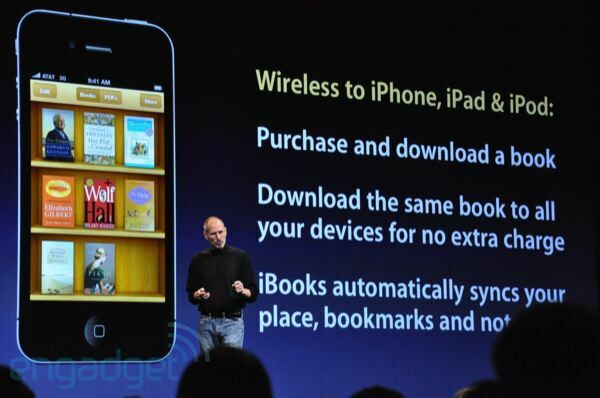 You can download the same book to all your devices at no extra charge. 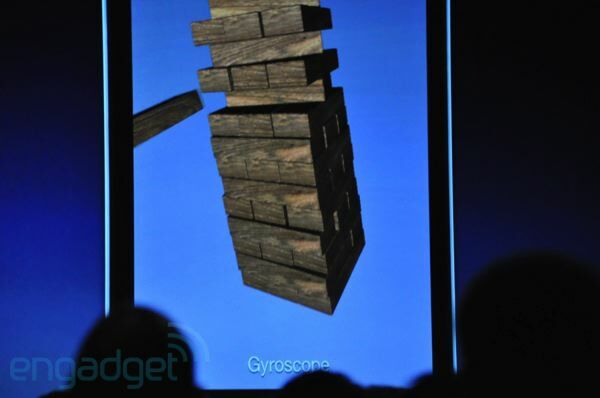 Buy it on your iPad, download to your iPhone. 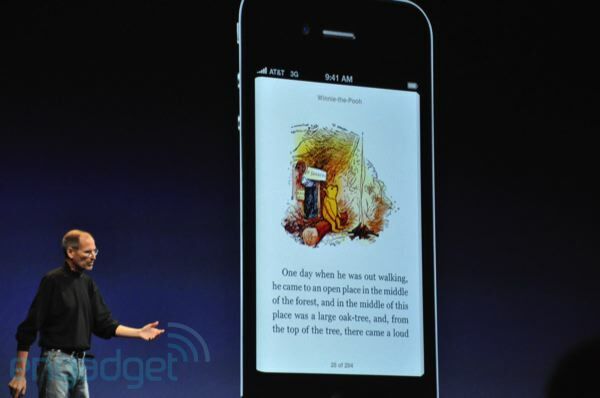 And iBooks will automatically and wirelessly sync your current place, all your bookmarks, and all your notes." No extra charge? We'll take it. 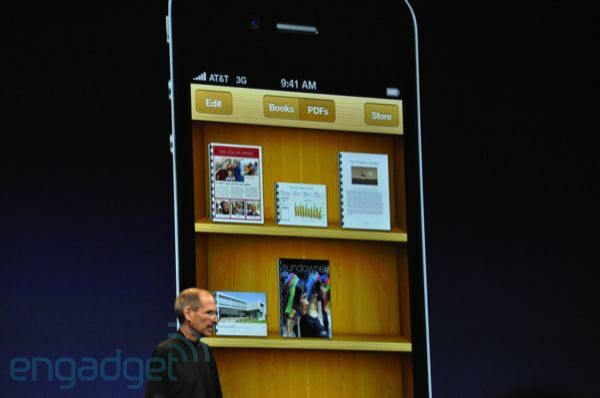 11:16AM "Same bookshelf to keep your books... PDF reader... we're really excited about this. 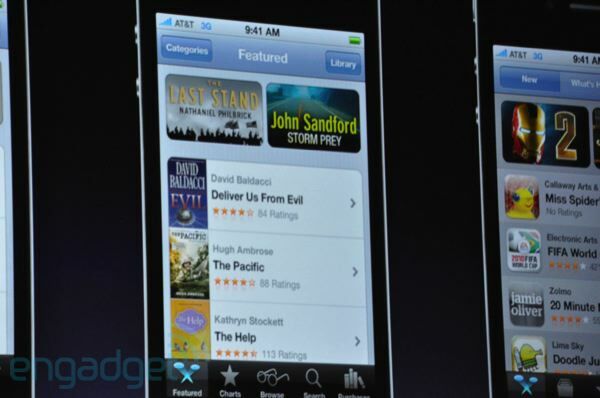 And of course, the iBookstore right on your iPhone." 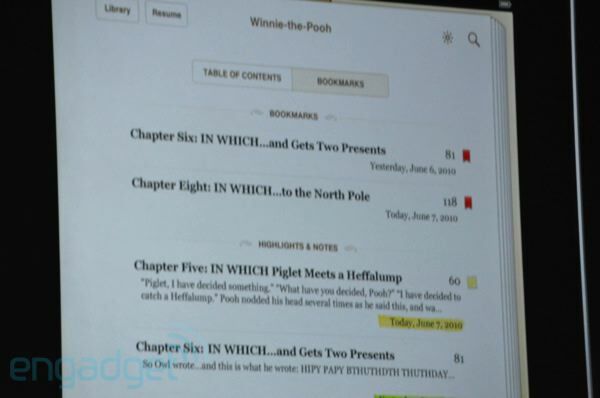 11:15AM "Number seven -- iBooks. 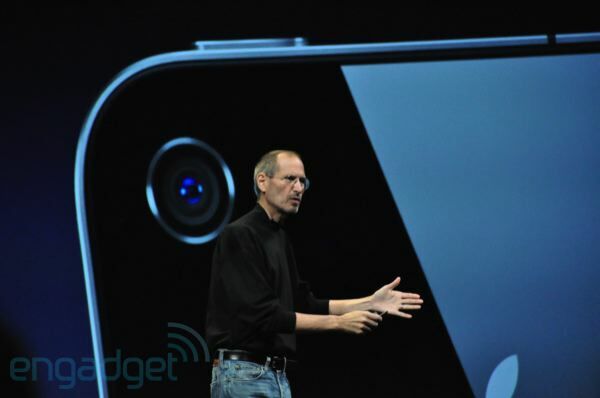 We are bringing it to the iPhone with the iPhone 4." 11:15AM "Now there's another major miilestone we're about to hit. 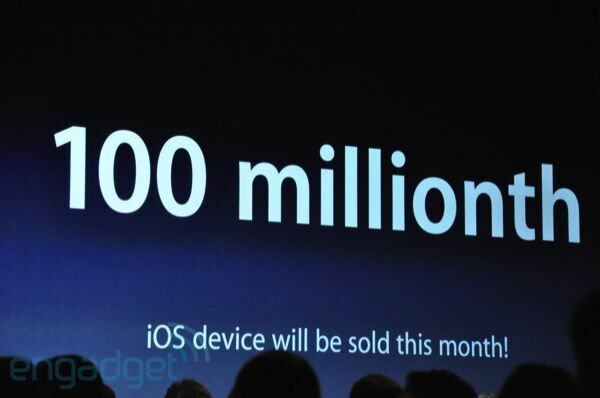 This month we will sell our 100 millionth iOS device. 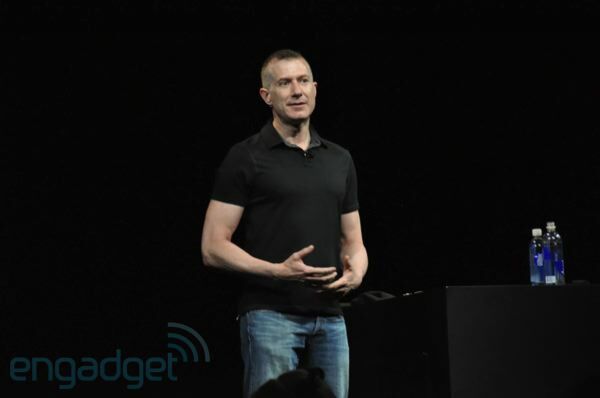 iPads, iPhones, iPod touch... there is definitely a market for your applications." 11:14AM "It will be out soon." 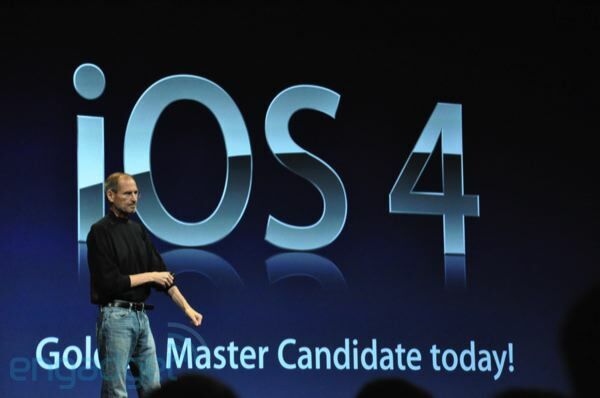 11:14AM GM candidate in devs hands today for iOS 4! 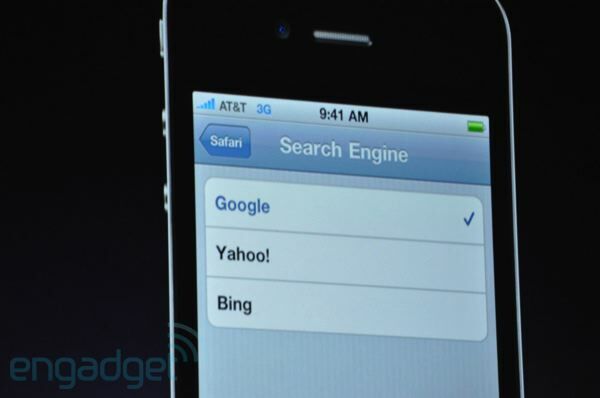 11:14AM "Microsoft has done a great job on this. Check it out, it's kinda cool." 11:13AM Wow. 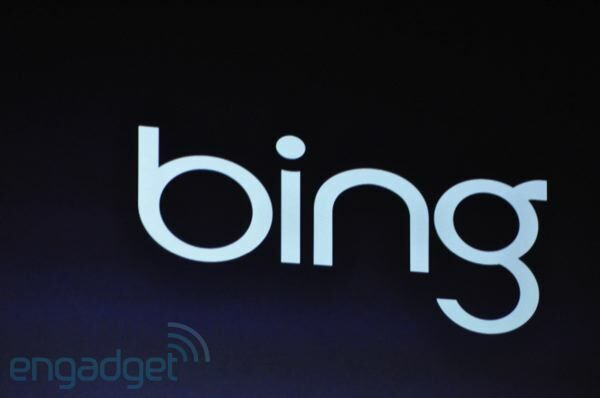 So they are actually adding Bing. 11:13AM "I wanted to hit on the enterprise stuff. Data protection, device management, multiple Exchange accounts... and on the consumer side, we have Google search and Yahoo!, and we're adding Bing." Whoa. Whoa. 11:12AM "Its really really helpful. 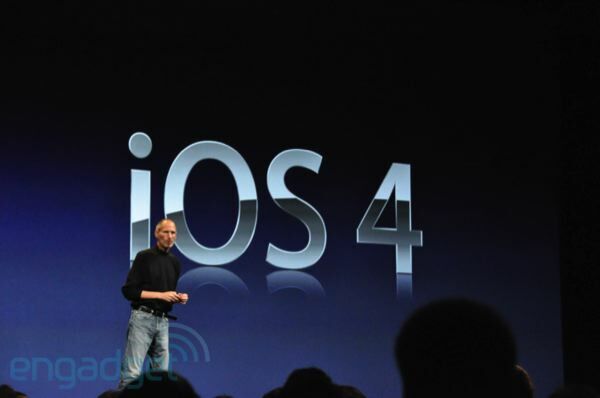 So that gives you a brief view of iOS 4." 11:11AM "So boom, there's my four apps." Finally a "boom"! 11:11AM "It makes it really easy to follow. 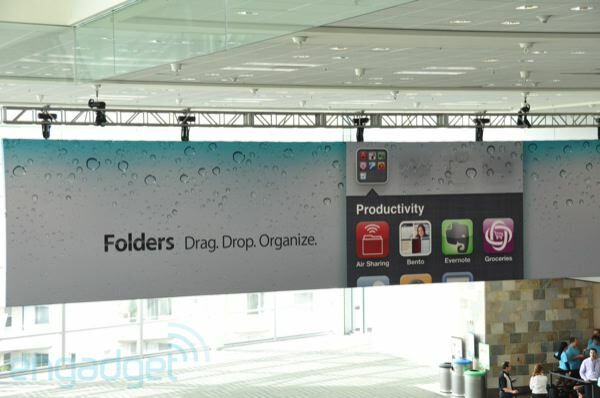 Now I'd like to go back to the home screen, and I'm going to create a folder. 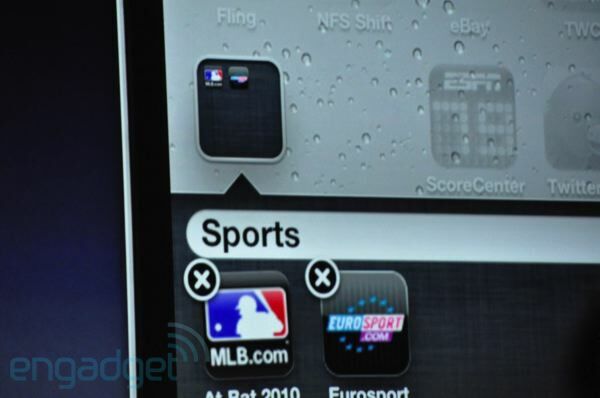 All I have to do is hold my finger on an icon, and drag it onto another icon, so I will drag this sports app onto another sports app and it automatically names it." 11:10AM "I'm gonna go back to mail... and I can swipe to the right and there's the audio controls for whatever audio app I'm using. And let me show you a few things in mail. 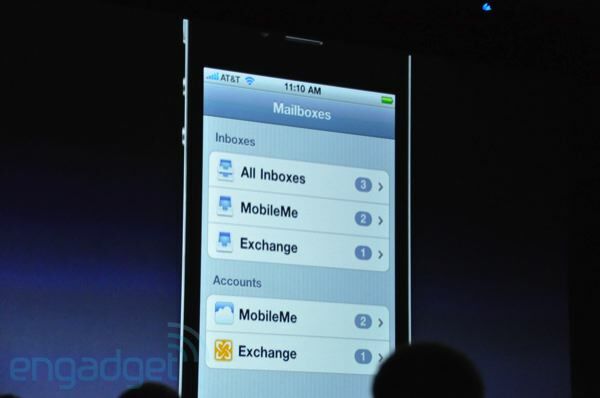 You can see I have the unified inbox, and I've also got threading. I can see all of the messages in a single conversation." 11:09AM "I'm going to play some music, now I'm going to check some mail. Now I'm going to go to webpage and fine out if we did turn off our WiFi devices." Yep. Huge applause. 11:08AM "We've added folders, and a whole bunch of other things I won't have time to demo today, but I'd like to demo these few things." 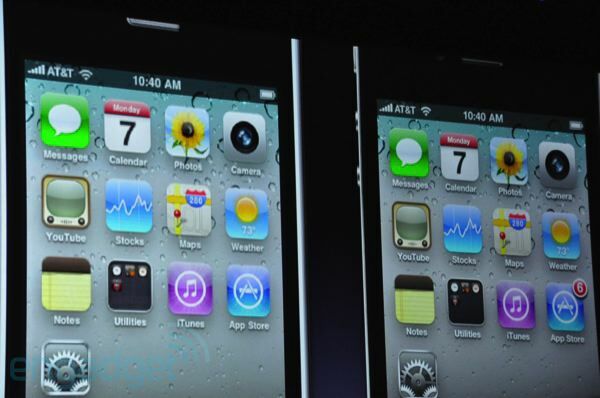 11:08AM "There are some big new features -- the first being multitasking. People said you weren't the first, but we figured it out. 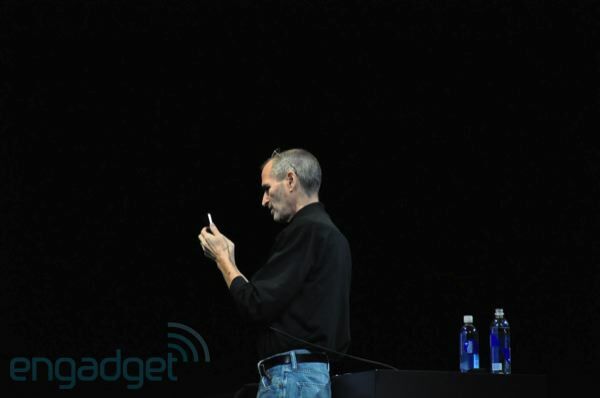 If you don't do it right, you kill the battery." 11:07AM "And we're going to give it some metal!" 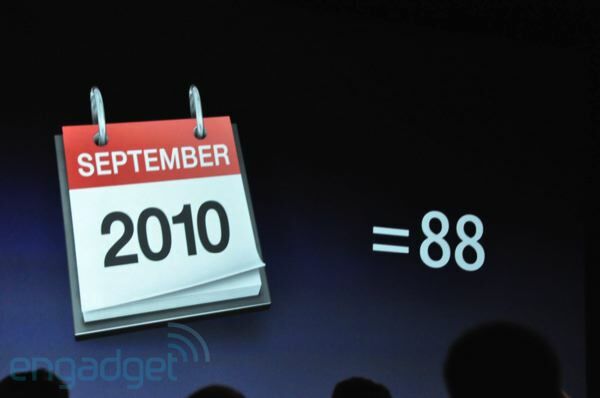 11:06AM "So number 6 -- iPhone OS 4. 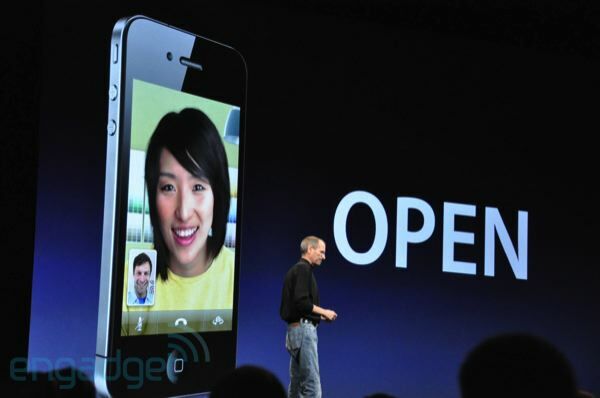 The most advanced mobile operating system in the world. First off, we're going to rename it." 11:05AM Guess what -- we're not doing that. 11:05AM He's asking people to set their laptops on the floor. 11:05AM Oh my god. 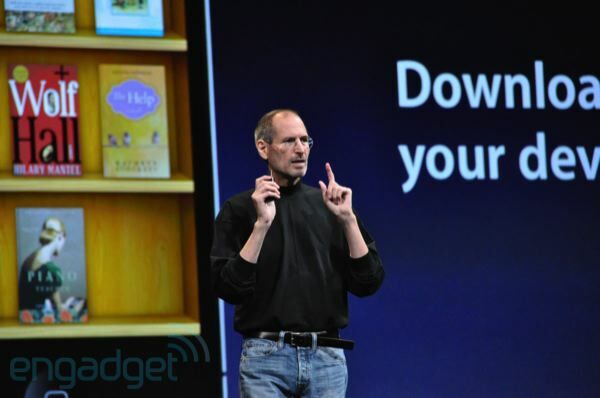 Jobs is asking everyone to turn off their network cards and MiFis! 11:04AM "I think you're going to like it a lot. Before I begin number 6... our guys were running around like crazy backstage... we figured out why the demo crashed...." Oh no, they're turning off the Wifi! 11:03AM "Isn't that awesome? 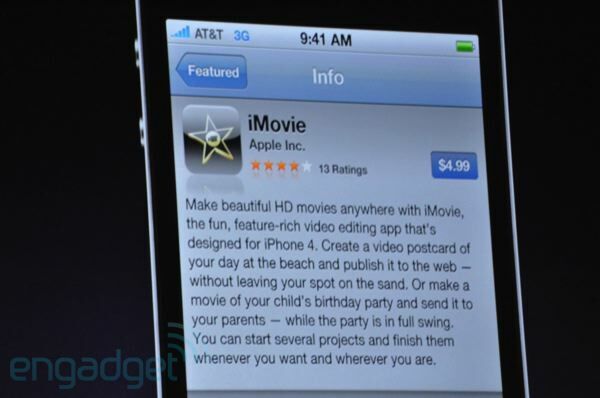 So iMovie for iPhone... you'll be able to buy this for $4.99... if we approve it." Ha! 11:03AM Big applause for the video. It was pretty stunning. 11:03AM Video recording looks amazing. The quality is extremely impressive. 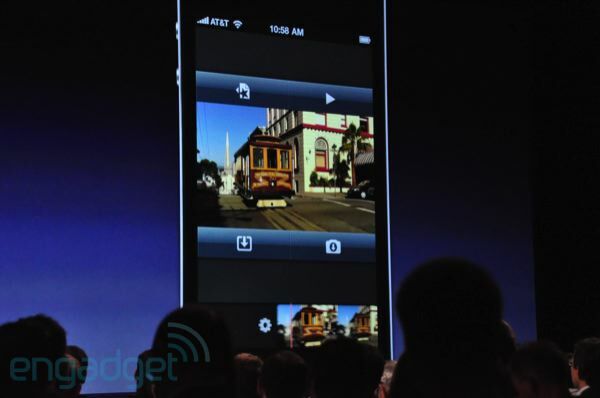 11:02AM "Here's a version at 720p, produced entirely on the phone." 11:02AM Transitions automatically change when you switch themes. 11:01AM Five different themes. Only five? 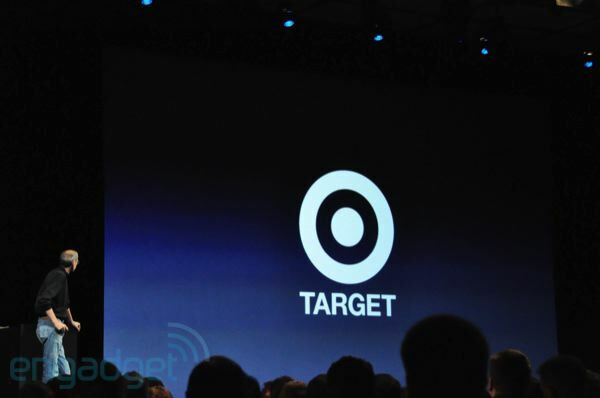 11:01AM Automatically records geolocation then adds them into certain themes. 11:00AM Transitions, titles... it's all here! 11:00AM You can add photos, they automatically get the Ken Burns effect. 10:59AM In the edit window you have a timeline along the bottom and your footage up top -- buttons dot the corners. 10:58AM "Thanks very much. I've been doing this a long time. 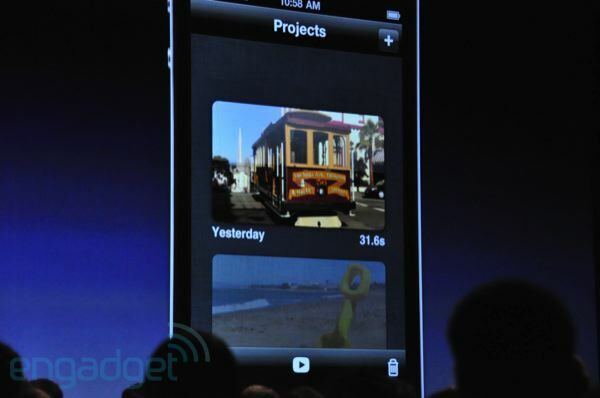 This year I had a chance to work on iMovie for iPhone, and it's one of the most exciting apps I've ever worked on. It's really amazing." 10:58AM "I want to show it to you... I want to invite Randy Ubillos..."
10:57AM "It's pretty remarkable, but we're going even further." 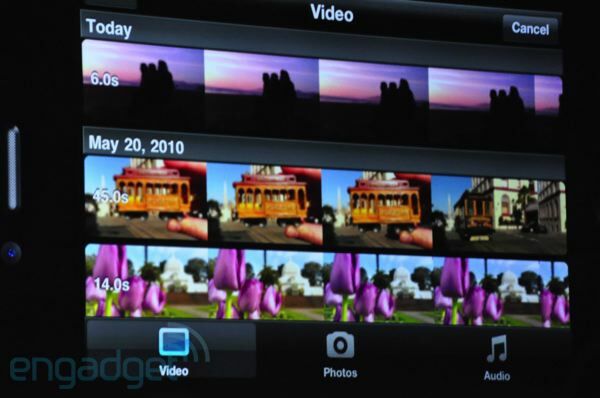 iMovie for iPhone! 10:57AM "We pioneered tap to focus, and we now have it for video... and we have one click sharing... and the LED flash will stay on for video recording. 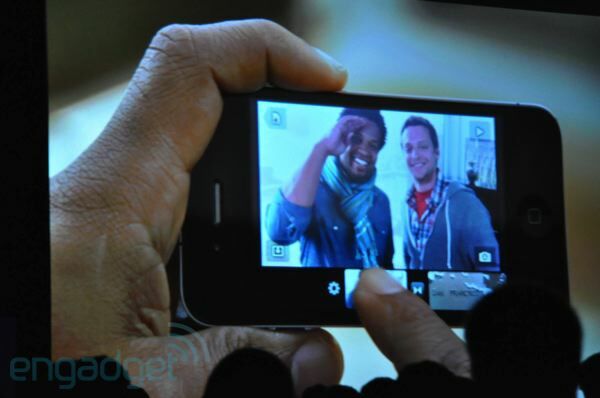 You can record, edit, and then with a few taps email it right on the phone." 10:56AM "So we're really happy. We think we have a great camera. 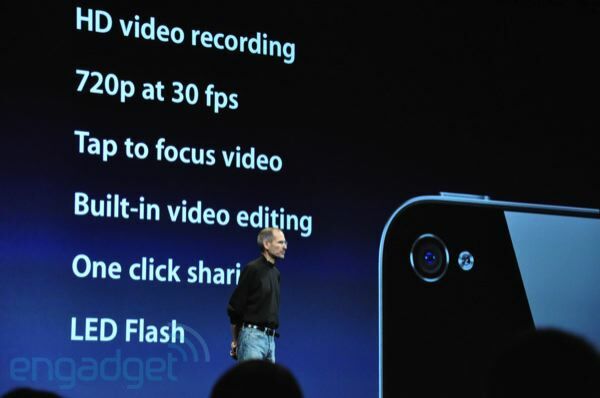 But that's not all... because it also records HD video." 10:56AM "The pictures we're taking are pretty remarkable. These haven't been touched in any way. It kills you what kind of quality you get. These were all taking by our employees, just culled some of the better ones I saw." 10:55AM "In addition to that, when most people increase megapixels they make them smaller, but we've kept ours the same size. They don't capture less photons. 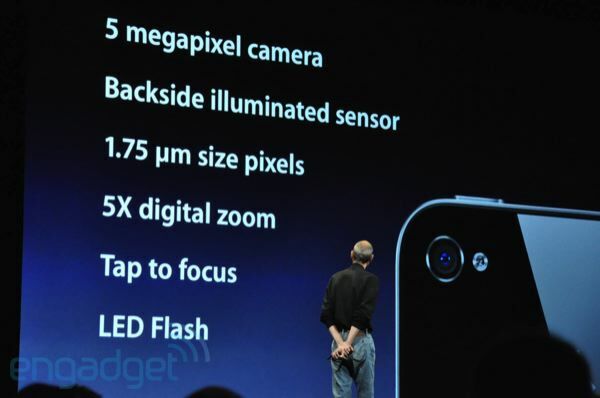 5x digital zoom, tap to focus, and we've got an LED flash." 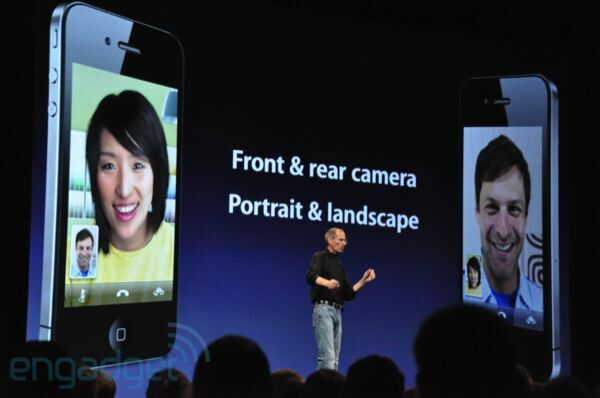 10:54AM "Now everybody loves to talk about megapixels, but we tend to ask the question how do we make better pictures? 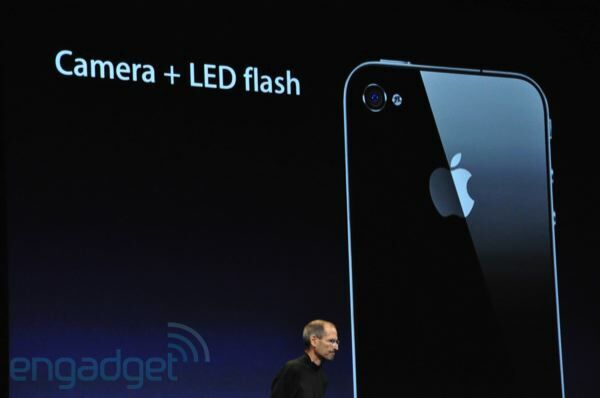 Megapixels are nice, but what these cameras are really about is capturing photons and low light photography. 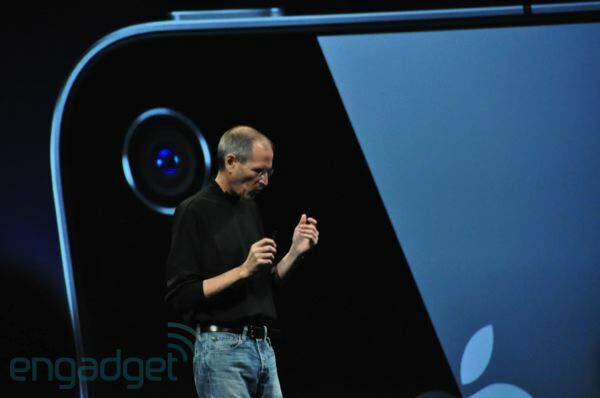 So we've gone from 3 megapixel to 5 megapixel, but we're using a backside illuminated sensor." 10:53AM "So that's number four. Number five: this is a great one. 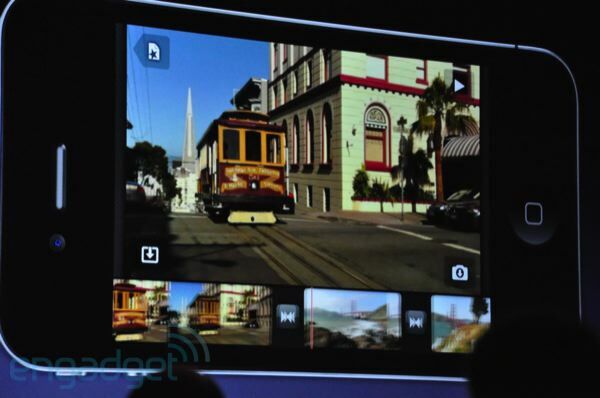 A whole new camera system." 10:53AM "So the gyro joins our four other sensors. 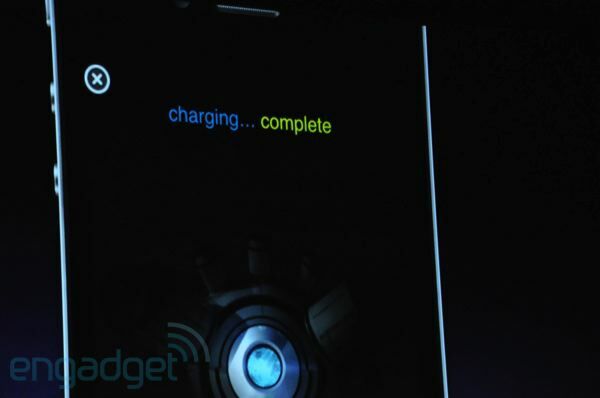 These phones are getting more and more intelligent about the world around them." 10:53AM The audience is ooh and aahing... "I practiced this a little bit." Oh, there you go -- the stack is done for! 10:52AM Steve is knocking blocks of wood out. 10:52AM Ha! It's like a game of Jenga! 10:51AM Wow -- Steve did a turn and the block went with him. Pretty darn cool. 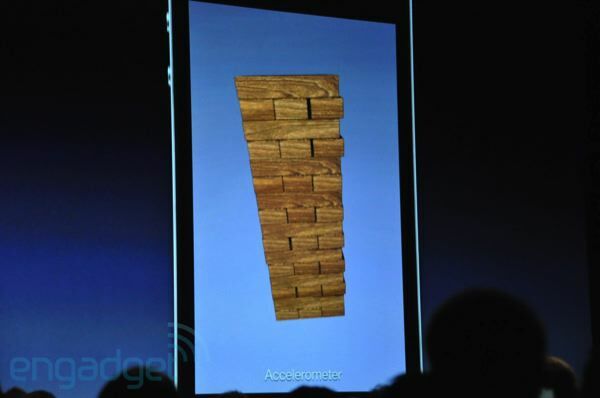 10:51AM "This is a little app that we wrote..." It's a stack of wood in 3D space. 10:51AM "I'd like to give you a demo of this. And since this does not require the network... I should be okay." 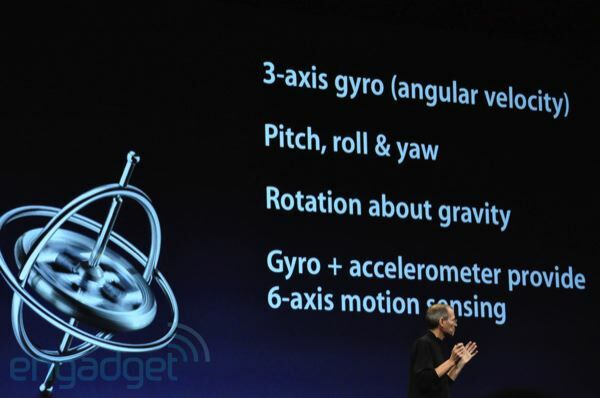 10:50AM "We're adding a 3 axis gyro, and we tied the gyro and accelerometer, compass, and gyro together for six axis. It's perfect for gaming." 10:50AM Big cheers for that. 10:50AM "Number four, we have another new piece of hardware. 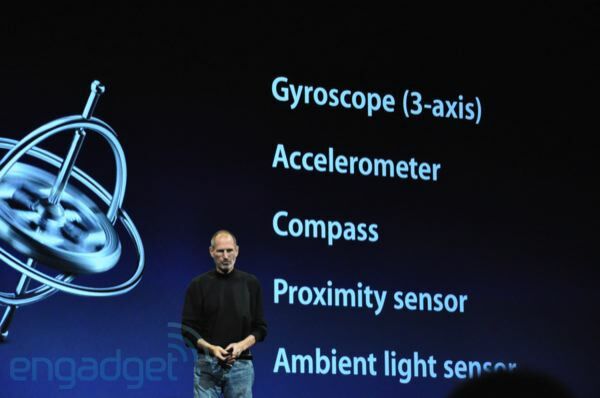 We're adding a gyroscope." 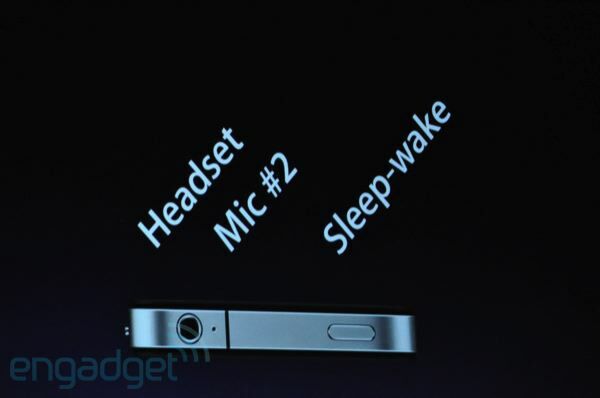 10:49AM Dual mics, 802.11n WiFi, GPS, compass, accelerometer. 10:49AM "And 300 hours of standby." 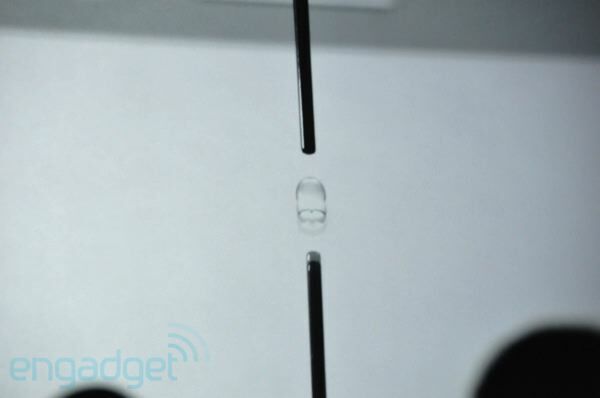 10:48AM "Because we've been able to make the batter bigger and because the A4 is so good, we've improved the battery life. 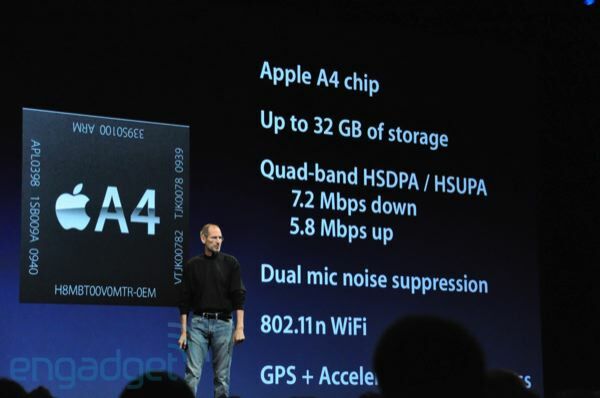 7 hours of 3G talk, 6 hours of 3G browsing, 10 hours of WiFi browsing, 10 hours of video, 40 hours of music..."
10:48AM "Third -- the iPhone 4 is powered by the A4 chip. This was designed by our own team. This is wonderful to have in the iPhone. 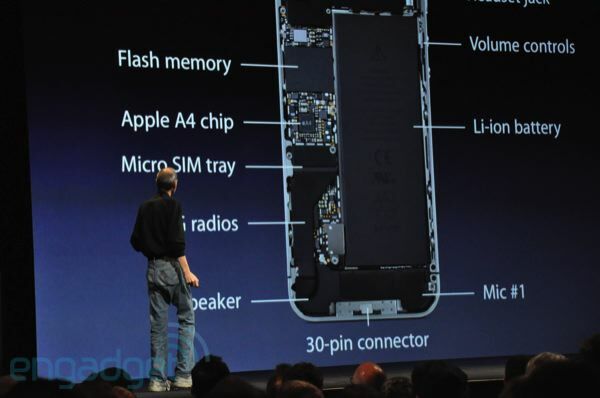 You take the back off -- first thing you notice is that the iPhone 4 is packed to the gills. 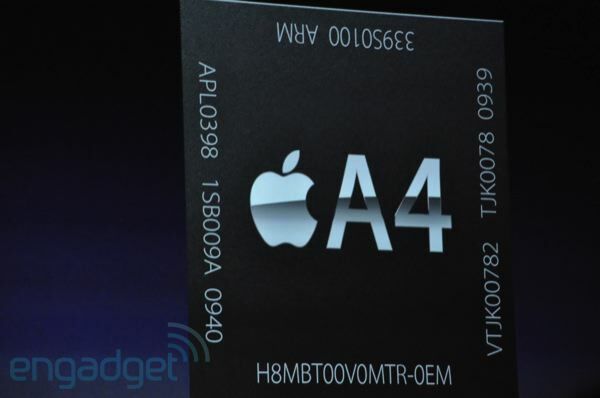 There's the A4 right there... micro SIM -- we needed the space! 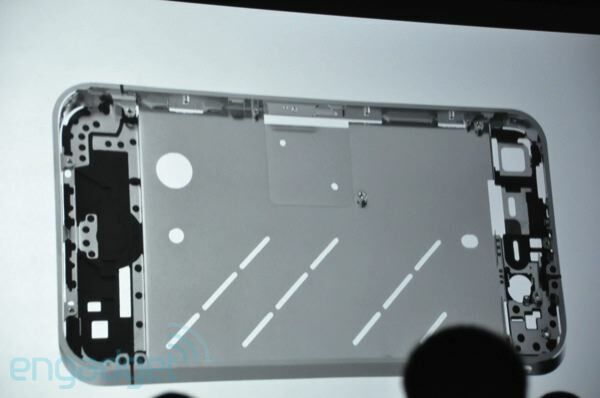 You can see the biggest component is the battery." 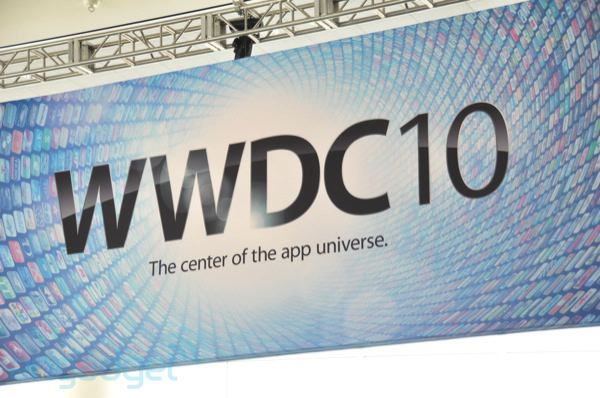 10:47AM "It's the window into your apps, your media... into your content. And we have something that's the best window on the planet." Well, that's hyperbolic a touch. 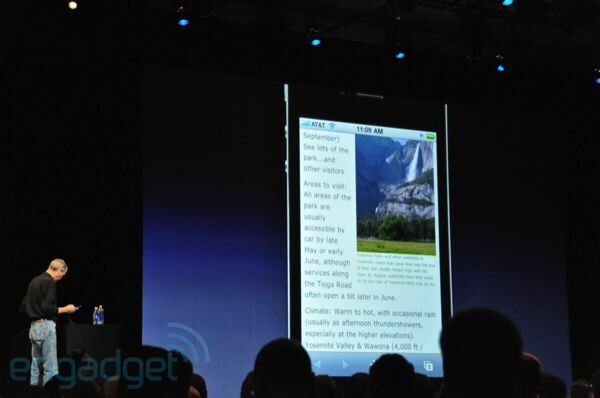 10:46AM "It makes it so your apps run automatically on this, but it renders your text and controls in the higher resolution. Your apps look even better, but if you do a little bit of work, then they will look stunning. So we suggest that you do that. 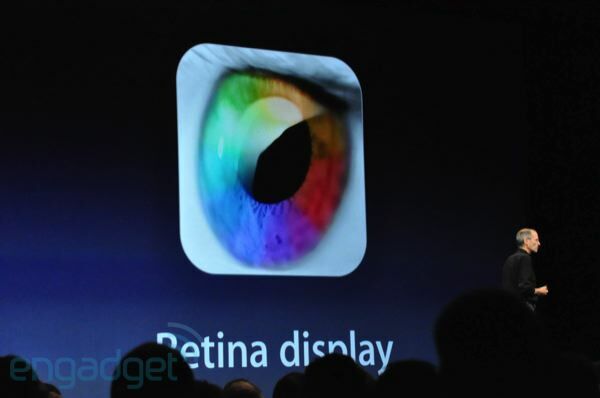 So that is the Retina Display. Awesome text, awesome images, and awesome video. We think this will set the standard, and no one is going to come close." 10:45AM 78% of the pixels on iPad. 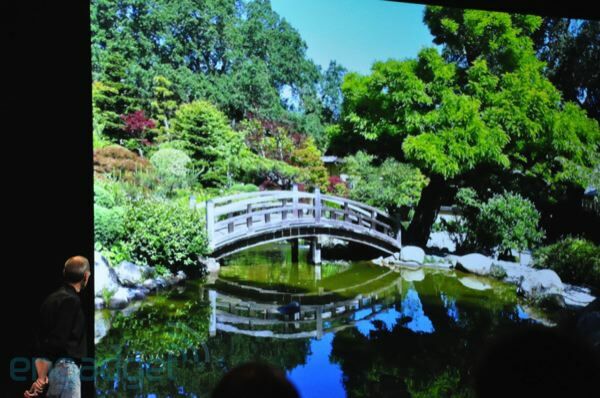 10:45AM IPS technology -- "Quite a bit better than OLED." 10:44AM Bang! 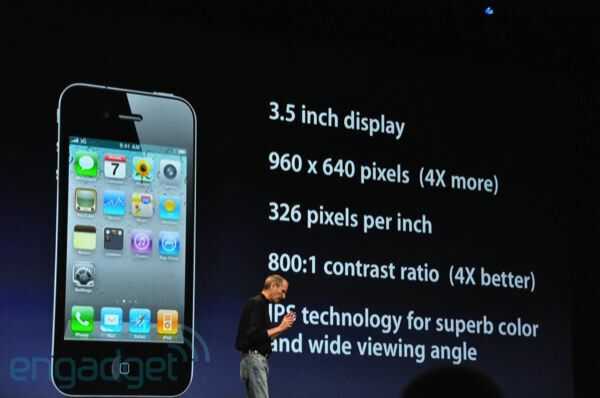 960 x 640 display. 10:44AM Seeing the NYT load has never been so exciting. "Scott, you have any ideas?" Someone yelled Verzion! Ha! 10:43AM "One more time... sorry guys..." Wait, it's loading. The audience is oohing! 10:43AM Someone is going down for this network glitch. 10:43AM "I'm afraid we have a problem and I'm not going to be able to show you much today... let's just go take a look at some photos here... take a look at that." 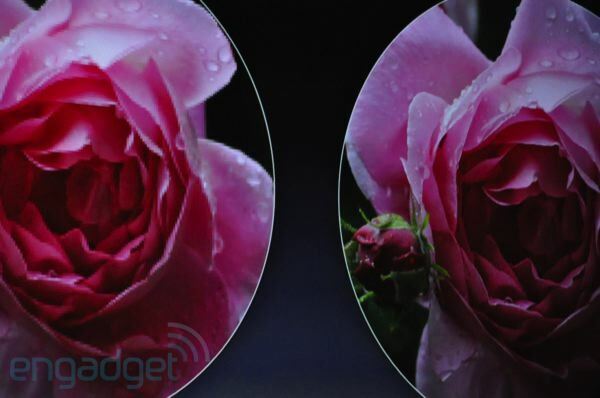 Wow, this is striking -- huge difference in quality. 10:42AM "Okay, we're going to switch over to some backups here, I have a feeling we might have the same problem..." Deadly silent here. Oooh, error ballon about the dock connector! "Well geez..." Wow. 10:41AM "You know you could help me out, if you're on WiFi if you could just get off... well we're having a little problem here." 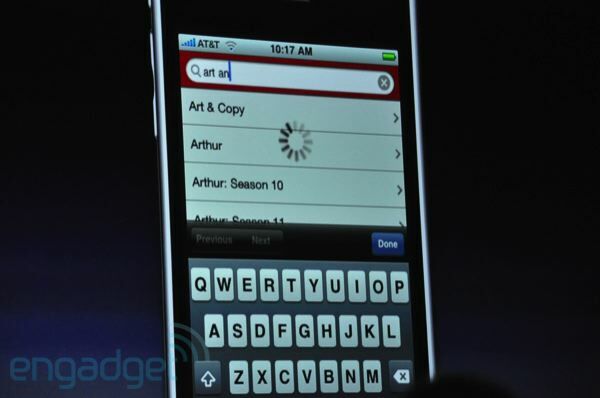 Oh boy, the iPhone 4 is NOT loading. 10:41AM "So now I'm going to go to some websites. 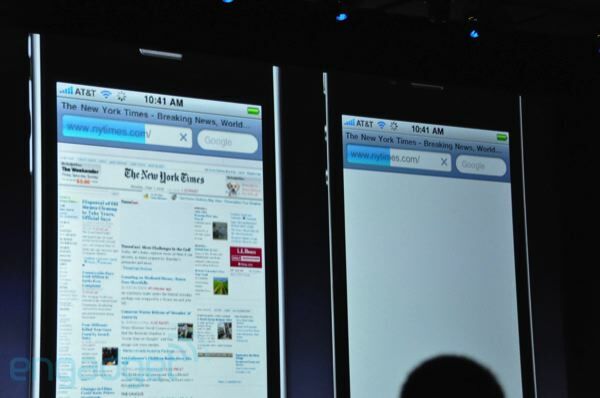 I'm going to go to the NYT... let's compare." Loading slowly... "Our networks in here are always unpredictable..."
10:40AM "Look at the icon, look at the text, look at the icon of the clock... isn't that amazing?" 10:39AM "So let me get them both fired up here." 10:39AM "So I'd like to show this to you live. 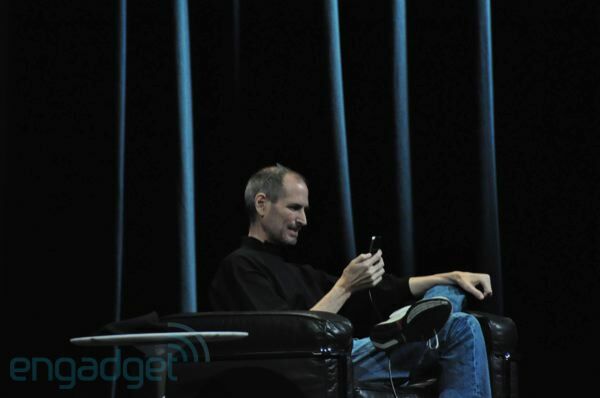 I have a 3GS here, and I've got a new iPhone 4." 10:39AM "Pretty amazing, isn't it?" 10:39AM "Once you use a Retina Display, you can't go back. When you get to character based languages it's also striking. And it's not just text. It's images and video as well." 10:38AM "We are comfortably over that limit. 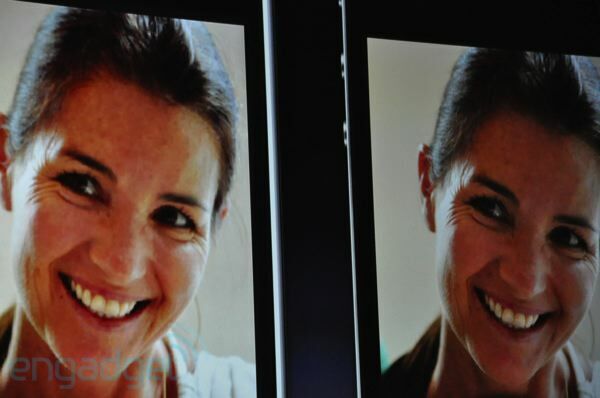 Here's a normal display on the left, and the RD on the right. Can you see it?" 10:38AM "People haven't even dreamed about a display like this. But there's more -- it turns out there's a magic number that is right around this ppi that when you hold it away from your face... all of sudden things start to look like continues curves. Like text in a fine printed book." 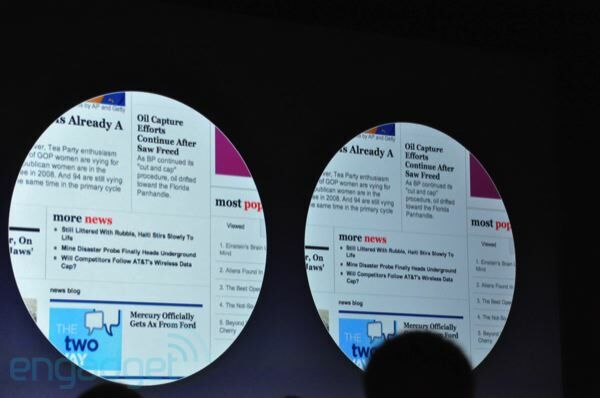 10:37AM "Because we have four times as many pixels, we get really, really sharp text. 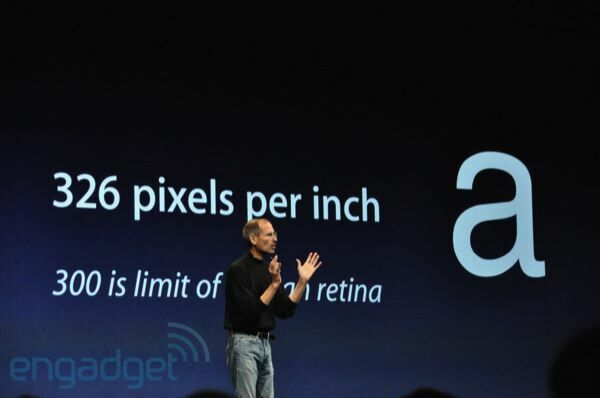 Now the retina display as 326 pixels per inch." Wow. 10:37AM "Why is that important? 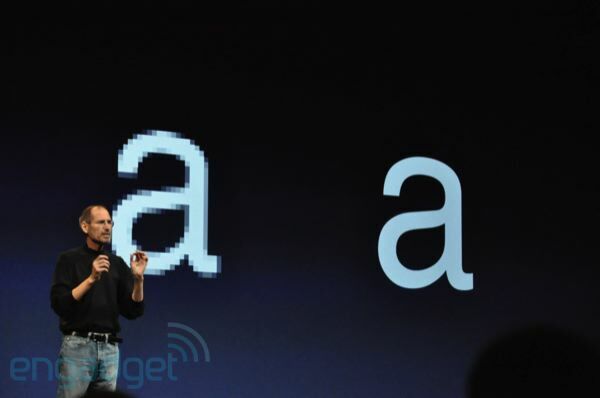 Let's say we want to draw the letter A -- as you can see, we can get far more precision. And we play all sorts of tricks." 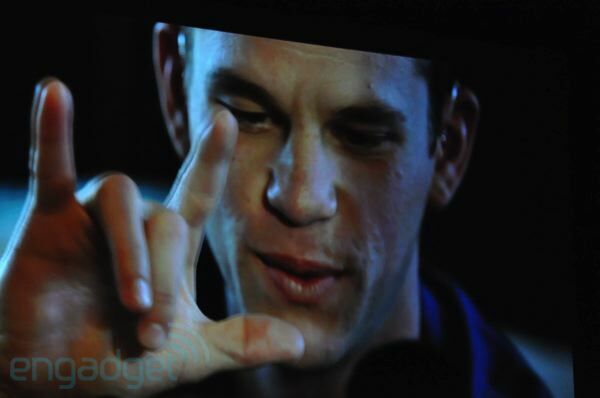 He's showing anti aliasing. 10:36AM "Second one, this is a biggie. 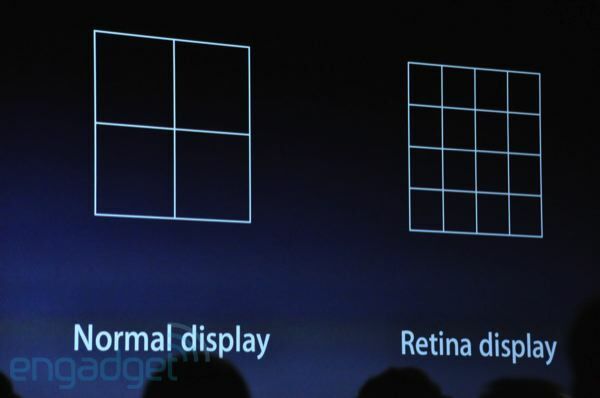 Something we call the Retina Display. What's that? 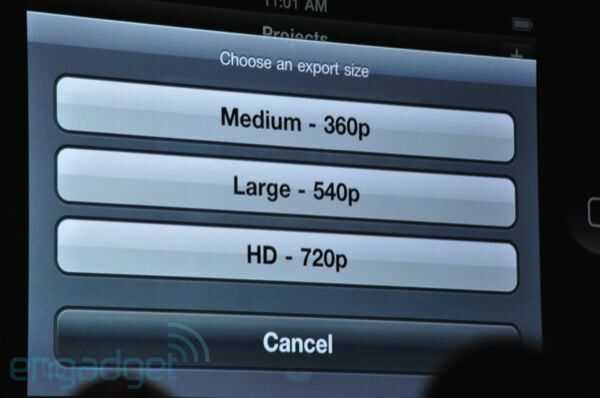 In any display there are pixels. 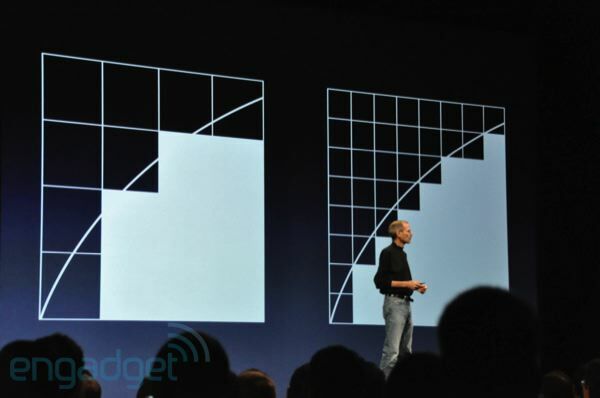 We dramtically increased the pixel density, Four times the amount." 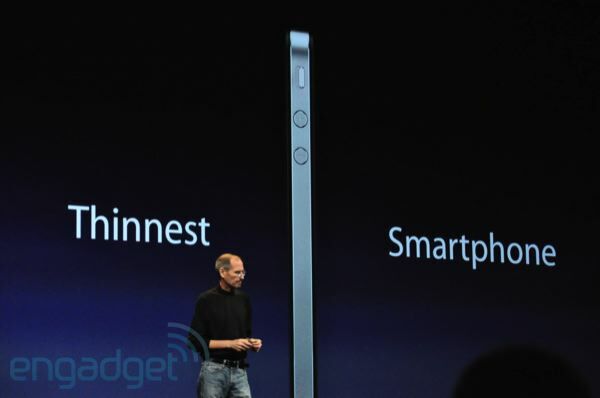 10:36AM "It's the thinnest smartphone ever. 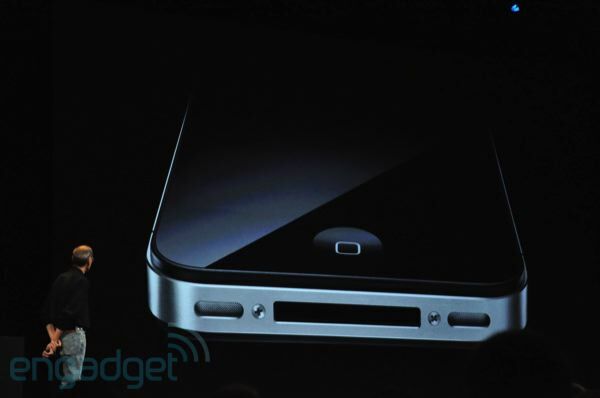 Stainless steel, glass on the front and back. 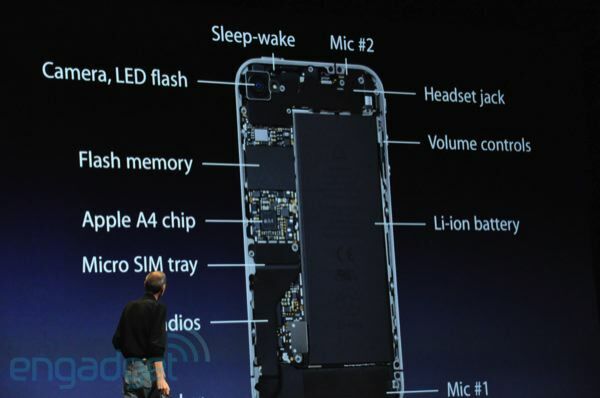 Extraordinary build quality. I don't think there's another consumer product like this. 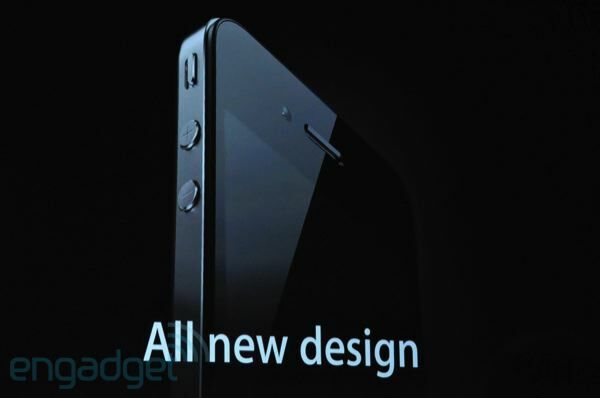 So this is our all new design for the iPhone 4. And that's the first one." 10:35AM "It's never been done before." Uh, we called this! 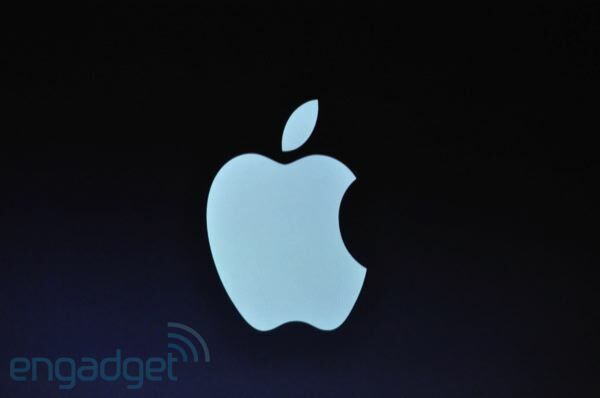 10:35AM "This doesn't look like Apple... what are these lines? 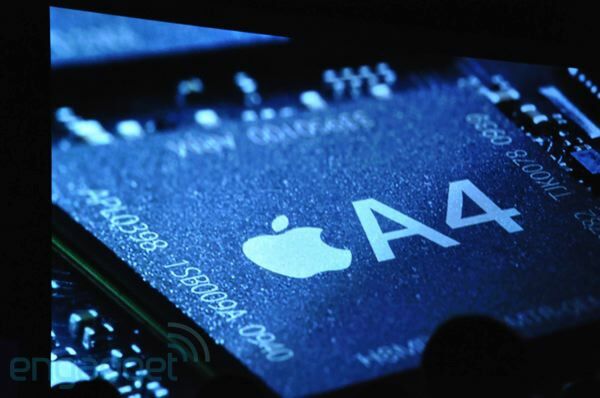 They are part of the primary structural elements of the phone... this is part of brilliant engineering. 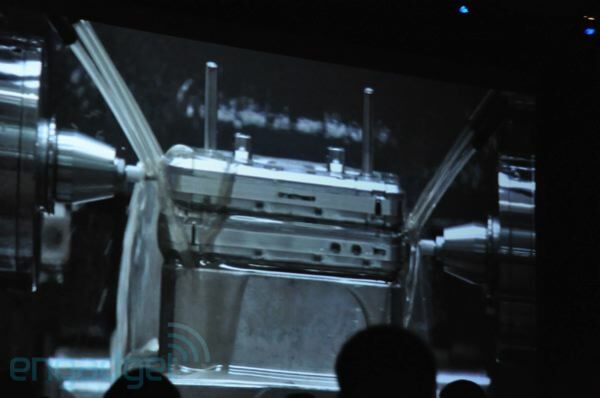 It uses the band as part of the antenna system!" 10:34AM "Now because there have been photos around, people have asked 'what's this'" The lines! 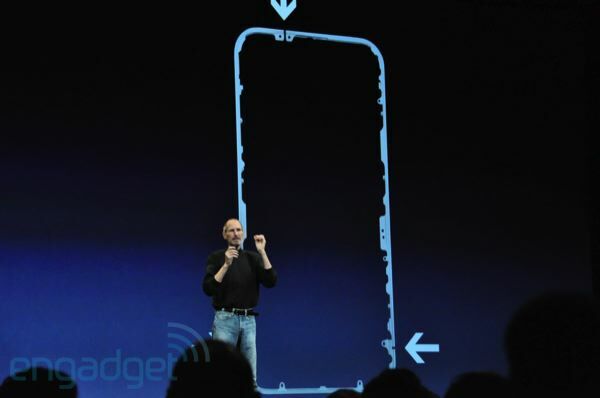 10:34AM "Bottom, mic, top, headset jack, noise cancellation mic..."
10:33AM "Here are the volume controls... we have a front facing camera, micro SIM tray, camera and LED flash on the back..."
10:33AM "As a matter of fact, it is the thinnest smartphone on the planet." 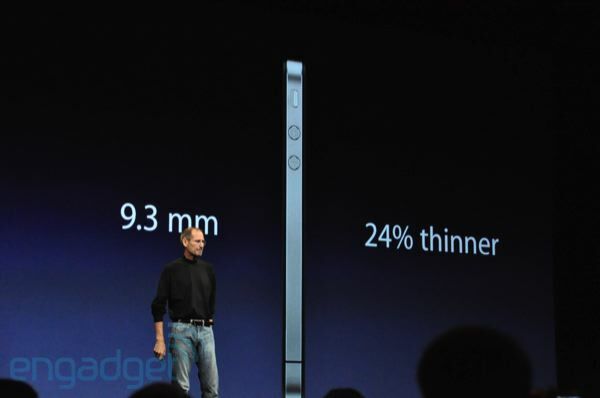 10:33AM "It is 24% thinner than the iPhone 3GS." 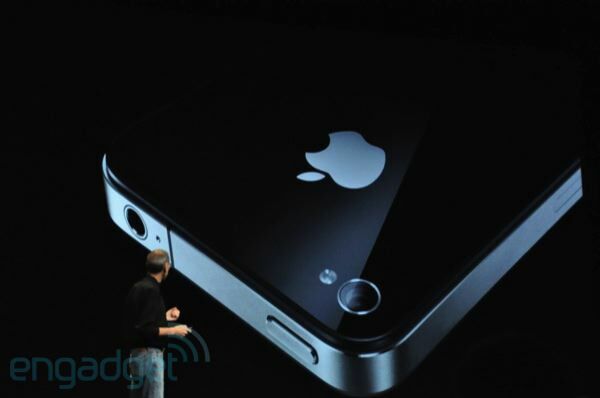 10:33AM "And it's really thin. 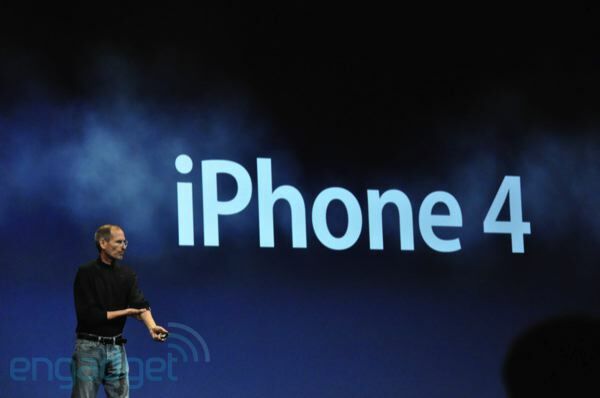 This is the new iPhone 4." 10:32AM "You gotta see this in person. 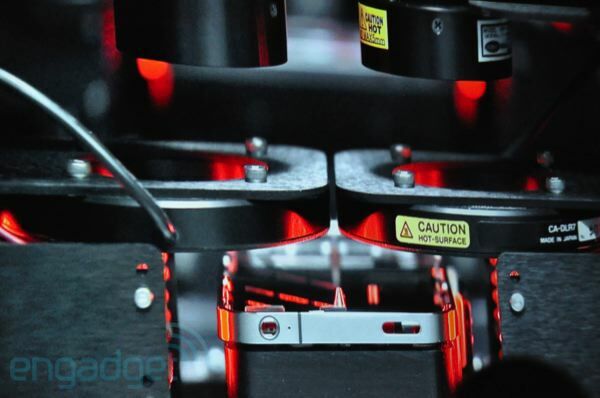 This is beyond the doubt, the most precise thing, and one of the most beautiful we've ever made. 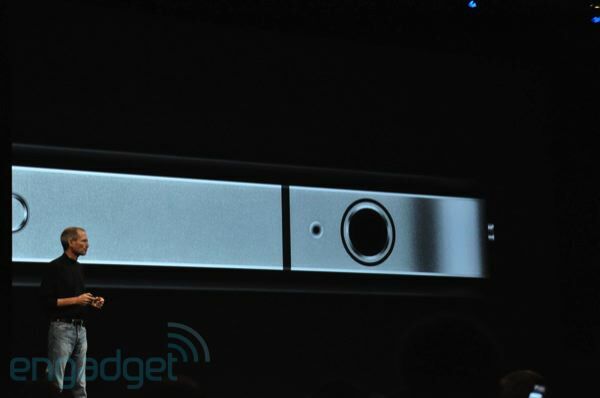 Glass on the front and back, and steel around the sides. It's like a beautiful old Leica camera." 10:32AM "You ain't seen it..."
10:32AM "I don't know if you've ever seen this." Ha! Huge cheers! 10:31AM "Now, this is really hot. 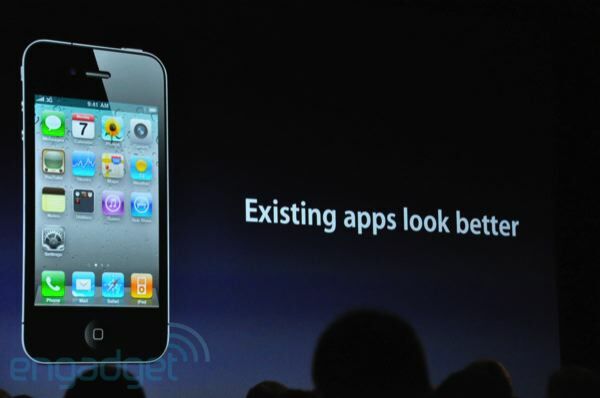 There are over 100 new features, but I'm going to cover 8. The first one? An all new design." 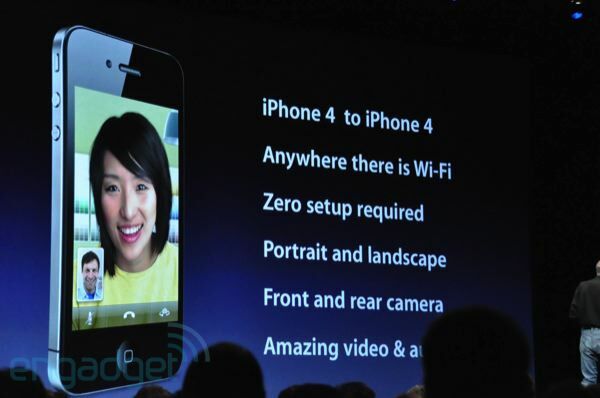 10:31AM "We're introducing iPhone 4." 10:31AM "It started to change things. 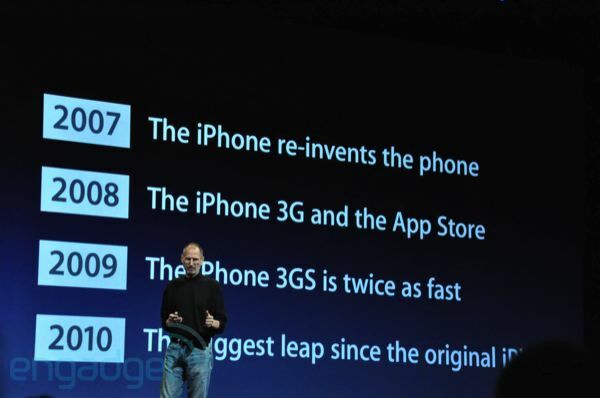 In 2008 we added 3G and the App Store, in 2009 the 3GS was twice as fast, and we added some other cool features like video... in 2010 we're going to take the biggest leap since the original iPhone." 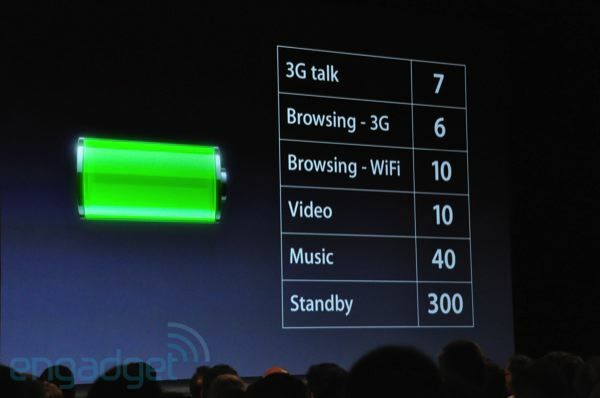 10:30AM "So let's get back to iPhone. 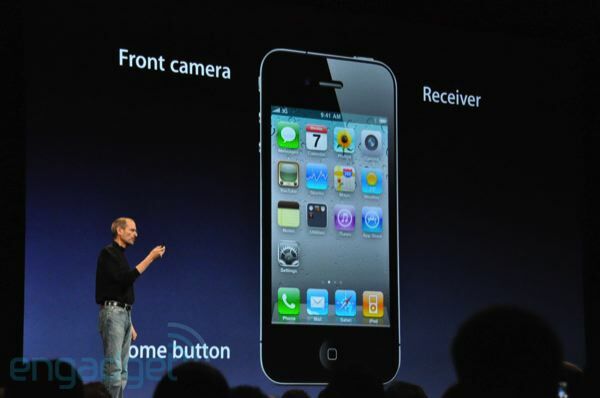 In 2007 iPhone reinvented what we thought of as a smartphone. It's hard to remember what it was like. 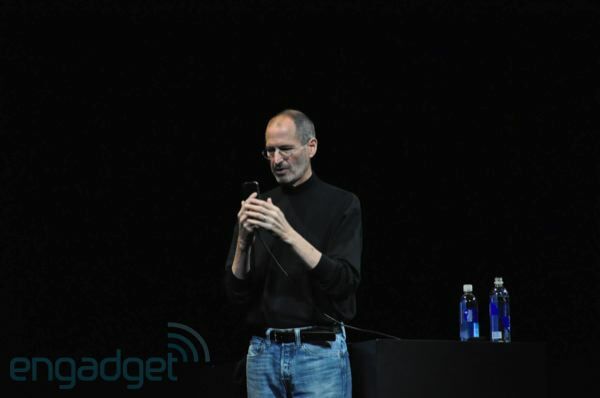 It was really different before the iPhone." 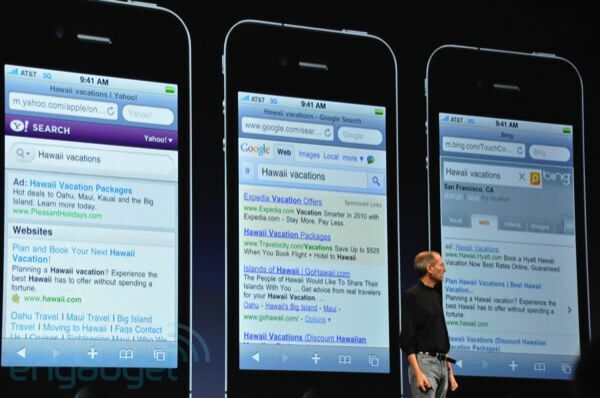 10:30AM "Here's another one -- mobile browser usage. 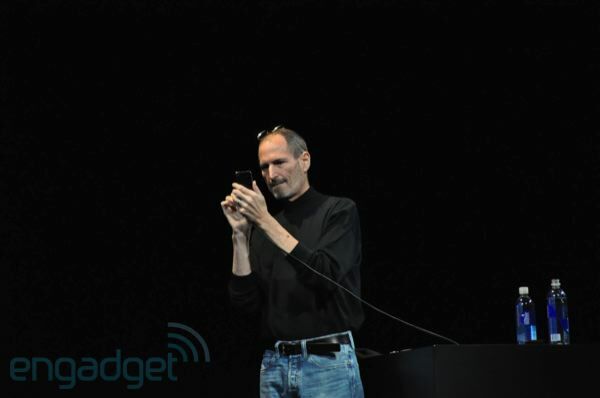 iPhone is at 58.2%, and Android is at 22.7%... that may help you put things in perspective." 10:29AM "There have been a lot of stats floating around, market research, studies. Some are okay, some are questionable. I'd like to give you two pieces of data. The first is a report that just came out from Nielsen. 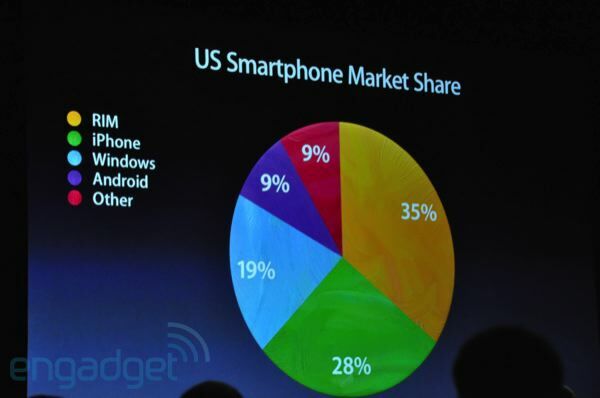 They said what is the marketshare in the US? 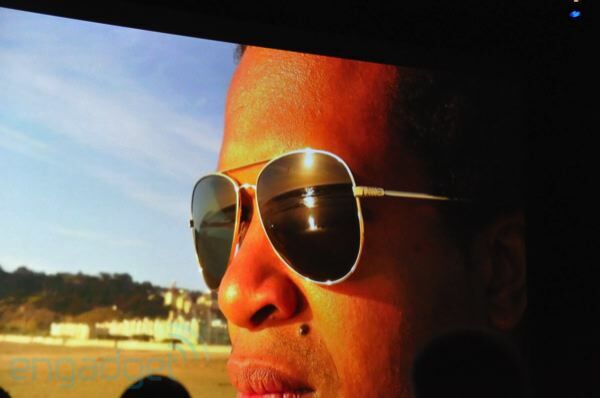 RIM, #1 with 35%, iPhone, 28%, Windows 19%, Android 9%... Nielsen said we're over three times the marketshare of Android." 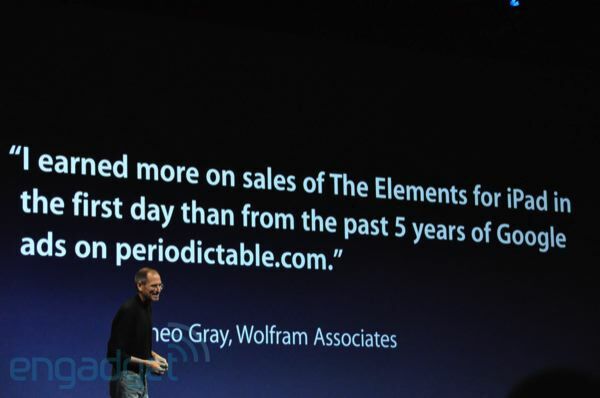 10:28AM "And that's what makes the app store the most vibrant on the planet. Not only for users but developers as well. 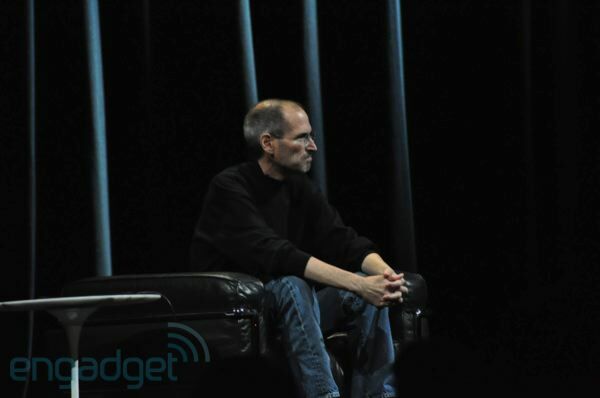 Now I'd like to talk about the iPhone." 10:27AM "I have a few great pieces of info to share with you this morning. 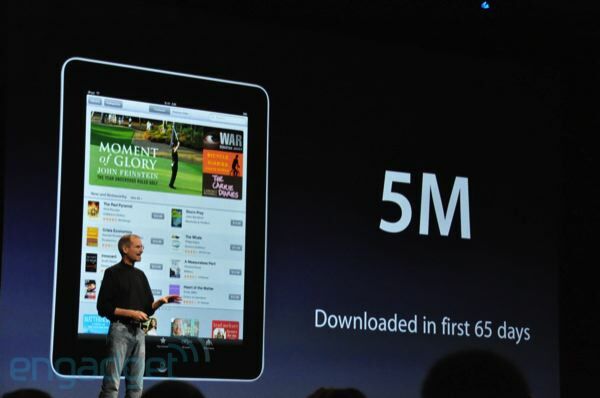 Last week we crossed 5b downloads. This next thing is my favorite stat of the whole show. 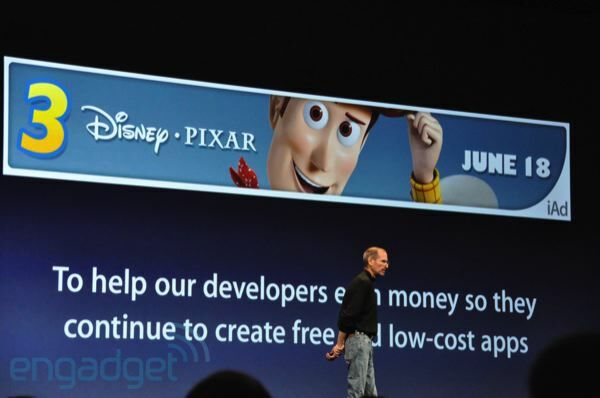 You know we give 70% of revenue to developers. So how much have we paid? To date? 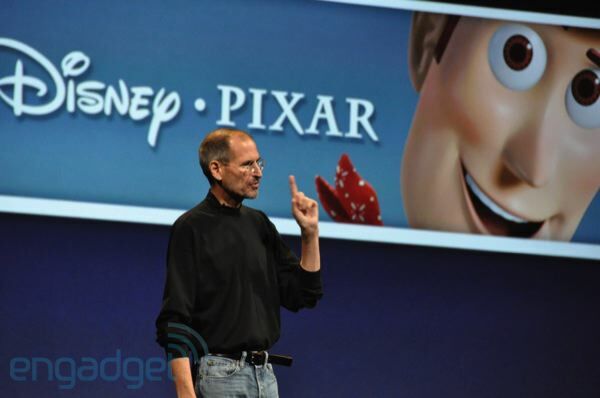 Just a few days ago we crossed $1b." Wow, ha. 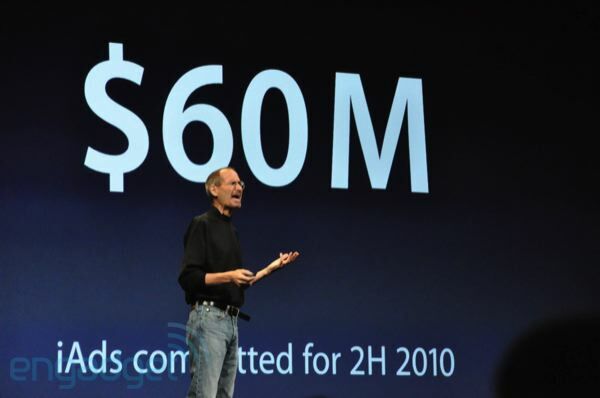 A check made out to "developers" for a billion! 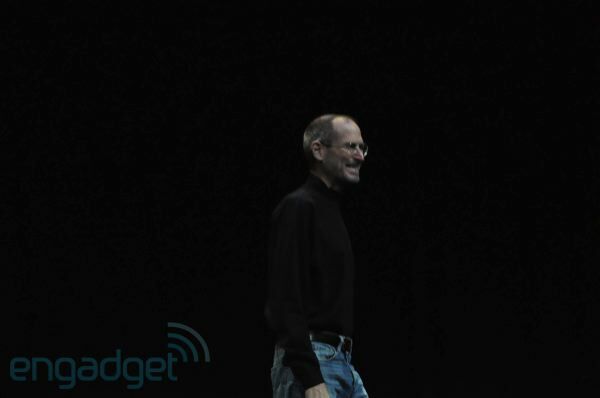 10:26AM Steve is back. "You know he was playing that in real time there... that's pretty cool." 10:26AM "You can start rocking out today -- it's available in the app store for $2.99." 10:26AM Oh goodness. There is air guitar happening on stage. And the music just got super loud! "You rock!" Big cheers for that. 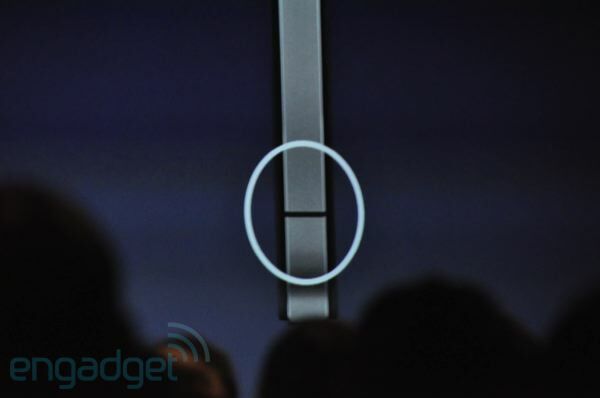 10:25AM "As you can see we have the obvious tapping mechanics. With the introduction of a new strumming mechanic, our team has made gameplay perfect." 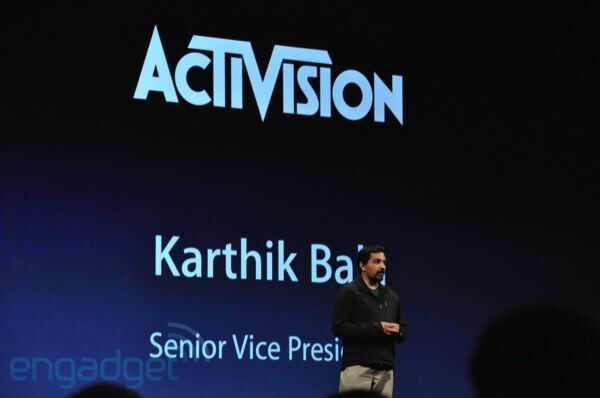 10:24AM "The game comes with classic rock from Queen and the Rolling Stones..."
10:24AM "We developed a brand new experience for the iPhone and iPod touch..."
10:23AM "Next up, Activision. 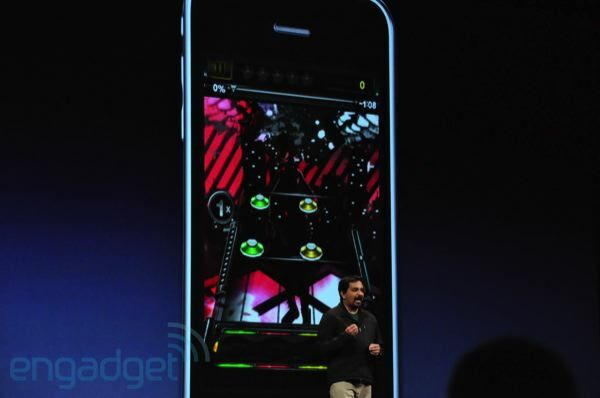 Karthik Bala is here to tell us about Guitar Hero." 10:23AM Available end of June. 10:22AM "Thanks, that's our game!" 10:22AM We're guessing this is really awesome if you play Farmville. We don't. Play it. 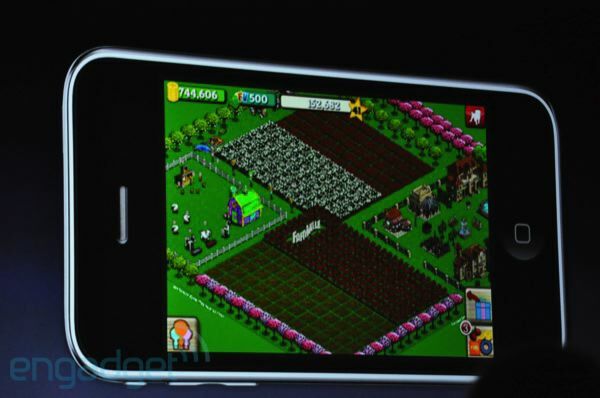 10:22AM "With Farmville on the iPhone, you'll be able to farm anytime, anywhere. But I'm most excited about how good tractoring just got." 10:21AM "We now have withering crop push notifications." Big laughs. 10:21AM In app purchases for the marketplace... if that's your thing. Ha! "Is that a Snow Leopard?" 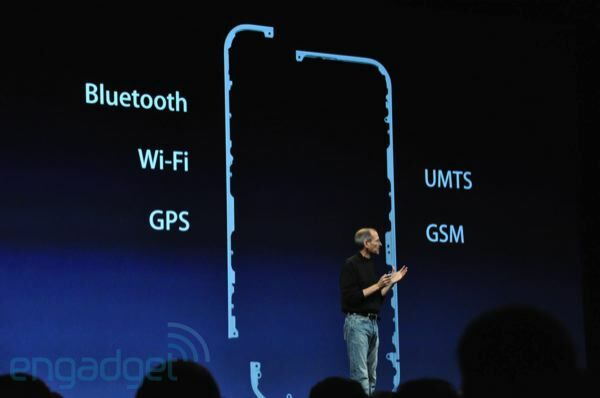 "It sure is, and it's only on the iPhone." 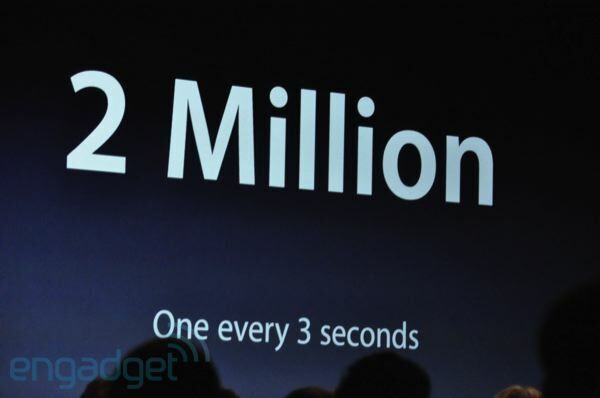 10:20AM "We have over 70m active users. They've raised over $2m for Haiti." Demo time. Ah, syncs with your Facebook farms, apparently. 10:19AM "Thank you for having us today. 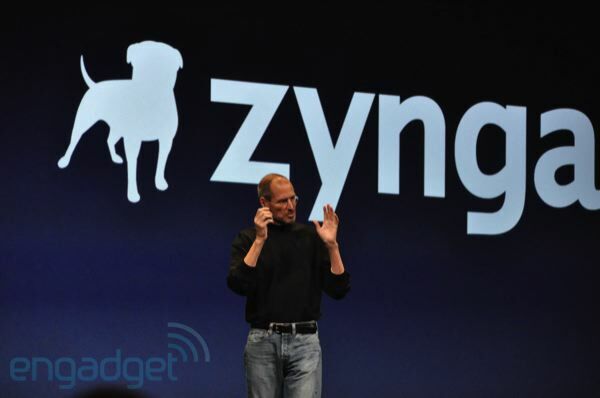 Today we're introducing 'Farming' for the iPhone. 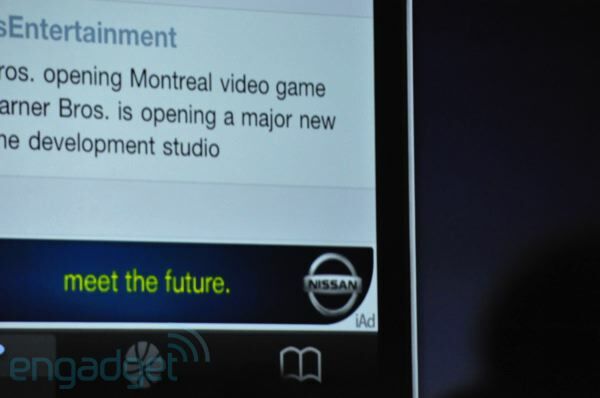 'Farmville' is our most popular game, and we're excited to bring it to the most popular mobile platform in the world." 10:19AM Steve is back. "That's great. Next up, zygna. Let me have them explain it." 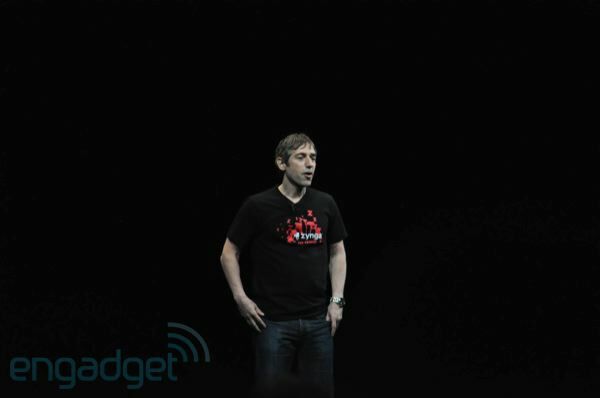 Mark Pincus from Zygna is out. 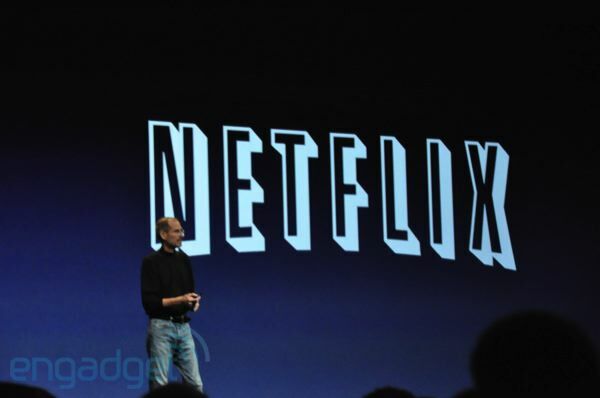 10:18AM "Netflix is taking advantage of Apple's adaptive bitrate technology. 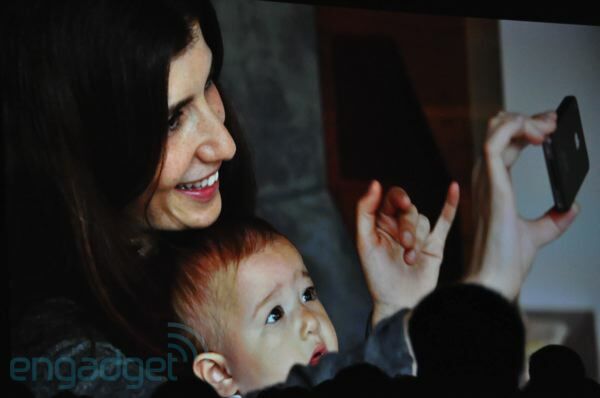 And it allows us to seamlessly switch between networks." Oh snap -- 3G is a go. 10:17AM Search, instant queue... yep... Netflix. On the iPhone. 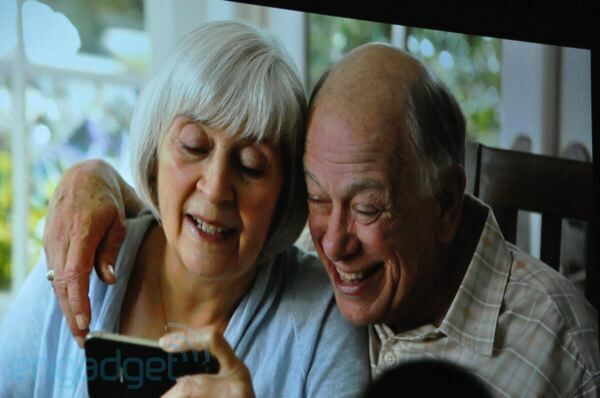 10:16AM "We just launched Netflix for the iPad, and it's been a huge success. It's the #1 most downloaded in entertainment apps. 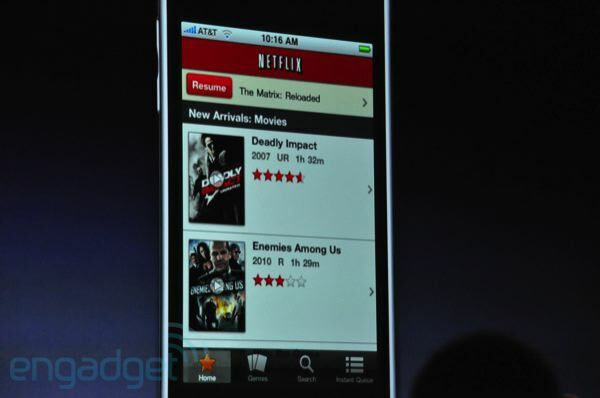 But I'm happy to announce Netflix for iPhone coming this summer, for free." 10:16AM Reed Hastings from Netflix is out! 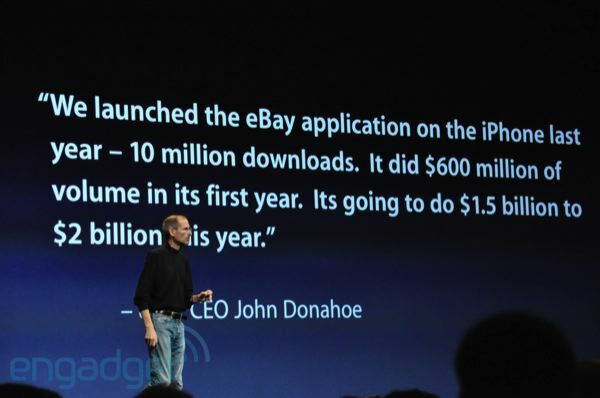 10:16AM "I'd like to highlight the eBay app -- a quote from John Donovan about the massive sales eBay has done in the iPhone app -- $600m." 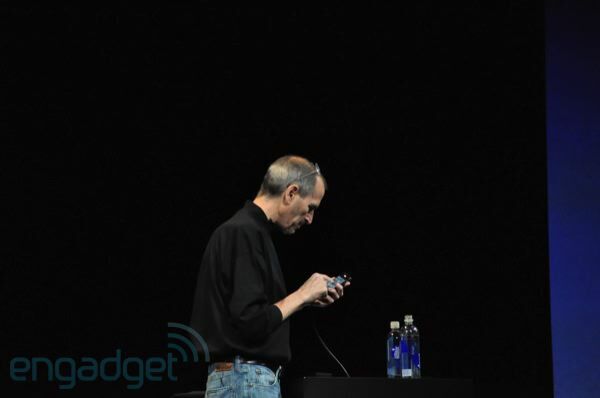 "Now I'd like to talk about something else... Netflix, Netflix on the iPhone." 10:15AM "If you were in our shoes, you'd be rejecting for the same reasons. Even with this, 95% are approved in seven days. Sometimes you read these articles and you think something is going on..."
10:14AM "What about the ones we don't approve? Well why is that? What are the reasons? 1: the app doesn't do what you said it would. 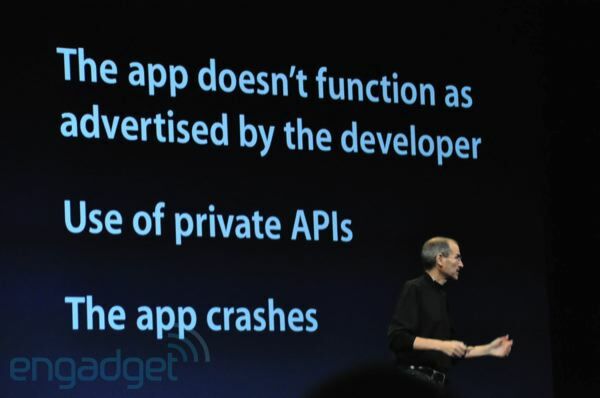 2: It uses private APIs... and if they change the app will break... and the third reason? They crash." 10:13AM "Guess what? 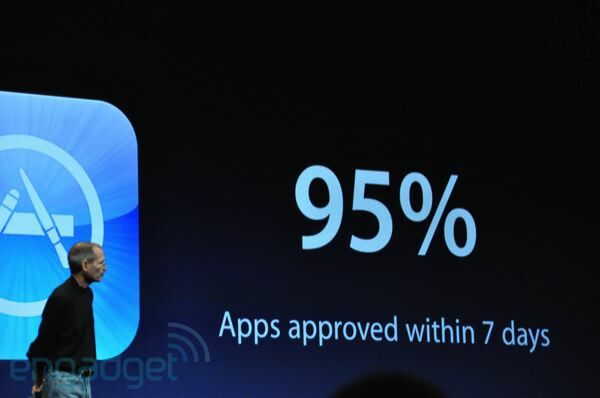 95% of all apps submitted are approved within 7 days." 10:13AM "So we have two platforms we support. 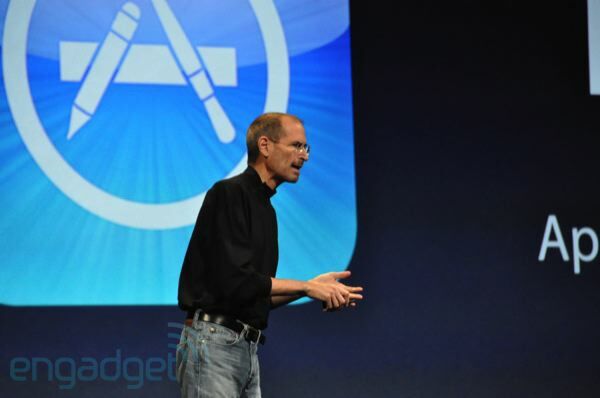 Now you've heard about our process of approving apps. We get about 15k submissions a week. They come in at up to 30 different languages." 10:12AM "Anyone can write HTML5 apps. 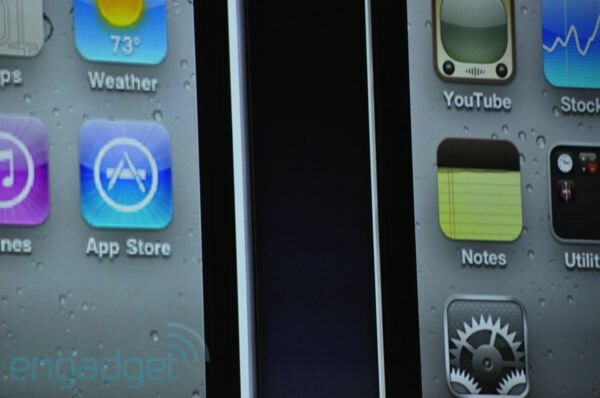 The second one is the App Store. 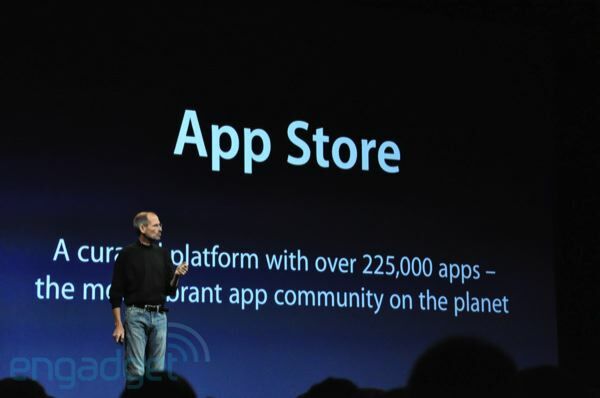 It's the most vibrant app store on the planet." 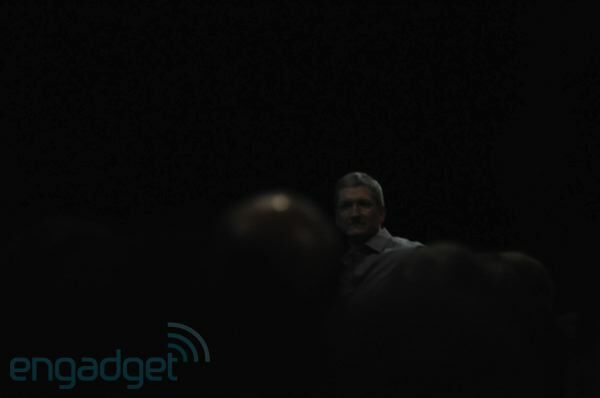 10:12AM "Next, I'd like to talk about the App Store. Before I do that, I want to make something clear. 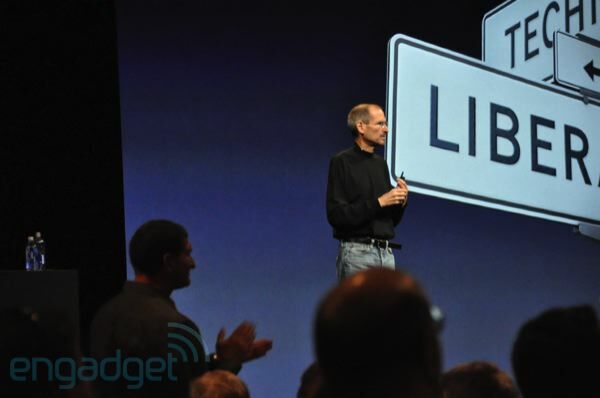 We support two platforms: HTML5 -- it's a completely open, uncontrolled platform. And we fully support it." 10:11AM "So PDF viewing built right in. That enhancement will be out later this month. 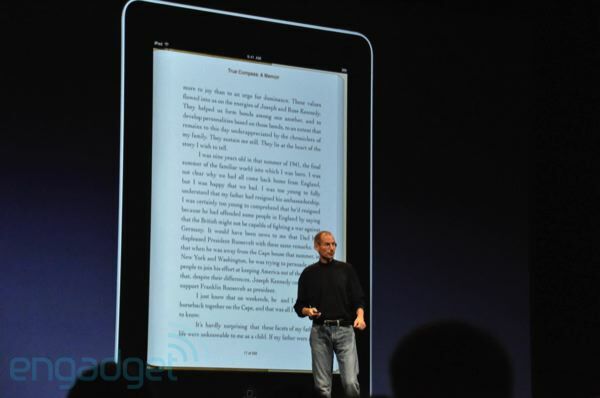 So that is my update for the iPad." 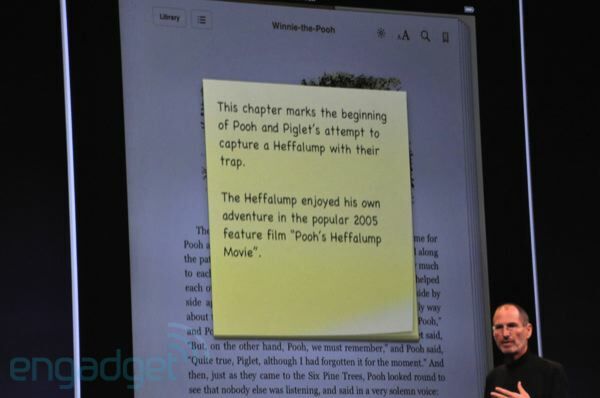 10:10AM "We're also adding PDF viewing in the app. 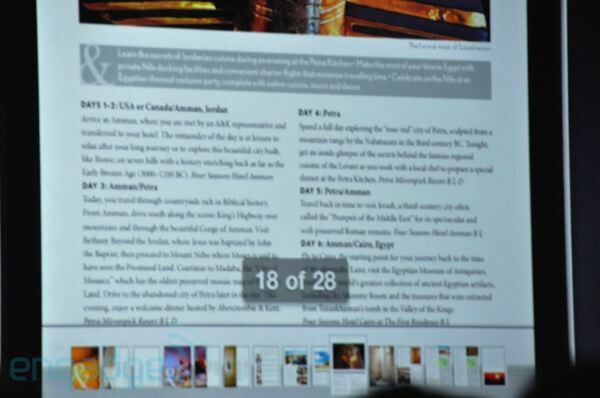 We've put a selector right up top, you can select PDFs, you get a whole new bookshelf. They just look gorgeous." 10:10AM "Publishers tell us that sales of their eBook sales are at 22% right now. 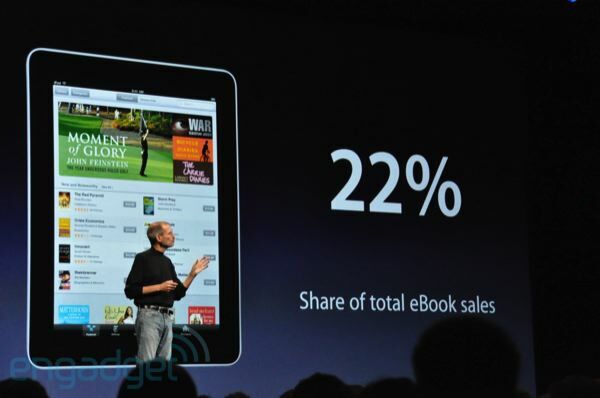 22% in iBooks. We're making some changes today -- notes, you can make notes right here, new bookmarks, and a new page displaying your notes and bookmarks." 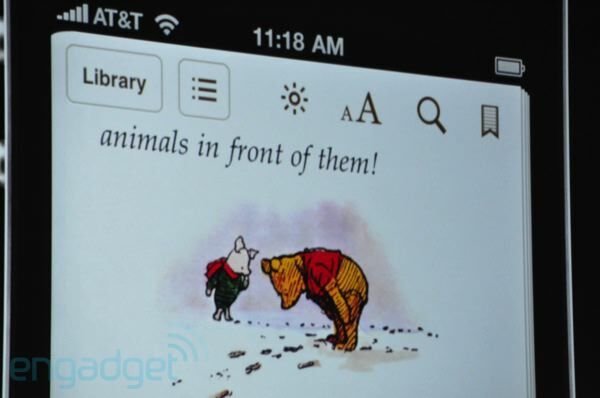 10:07AM "Here's an app that's really cool -- it's called The Elements." 10:06AM Big cheers -- and Steve is back out. 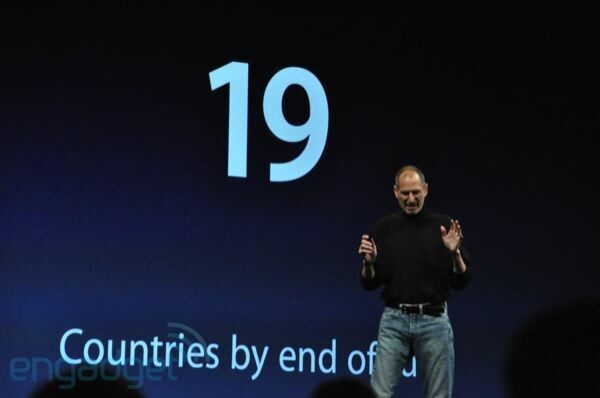 "We're in 10 countries today, we'll be in 19 by July. 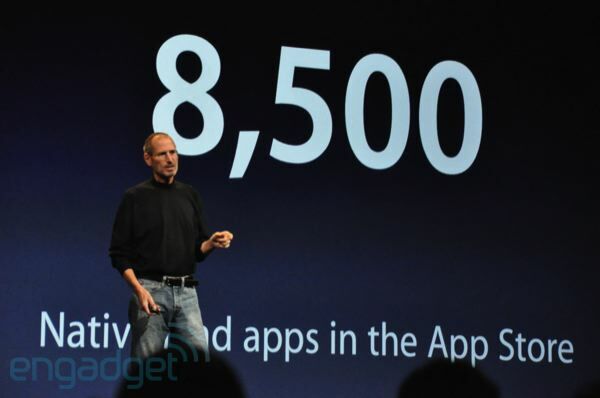 So there are now 8500 iPad apps in the app store. 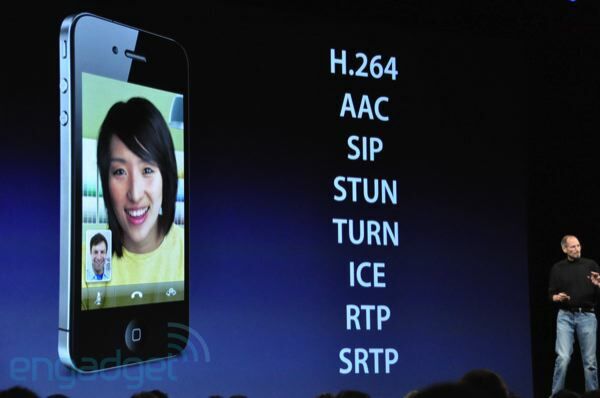 It can run iPhone apps too. 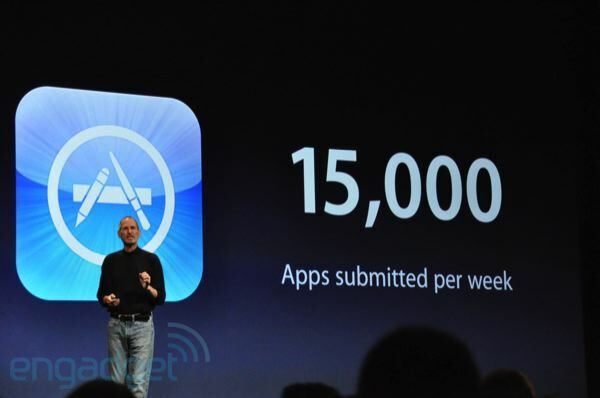 These 8500 apps have been downloaded over 35m times. 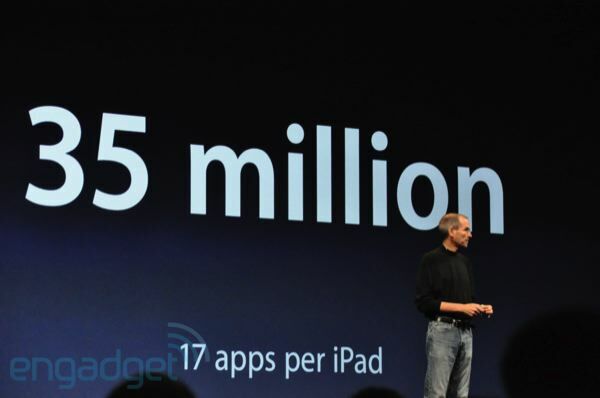 That's about 17 apps per iPad that have already been downloaded. That's a great number. Let me show you a few." 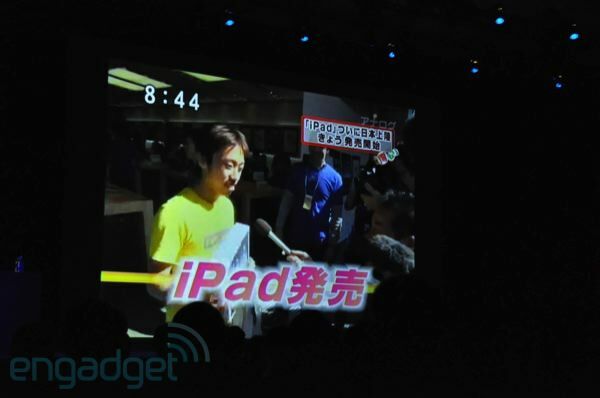 10:05AM Yes, people are freaking out all over the world about the iPad. Really really freaking out. 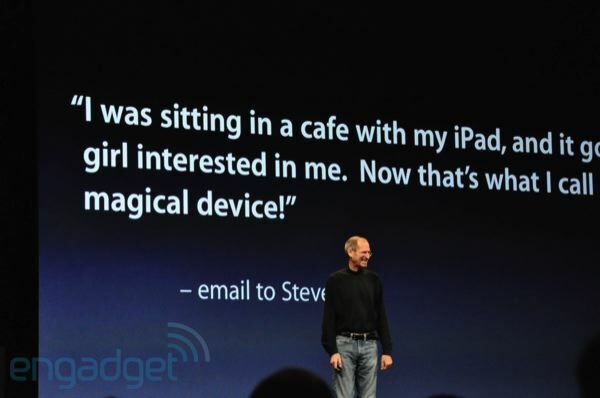 10:04AM "It is magical, I know it because I got this email: I was sitting in a café with my iPad, and it got a girl interested in me!." "So there's proof." Huge cheers. 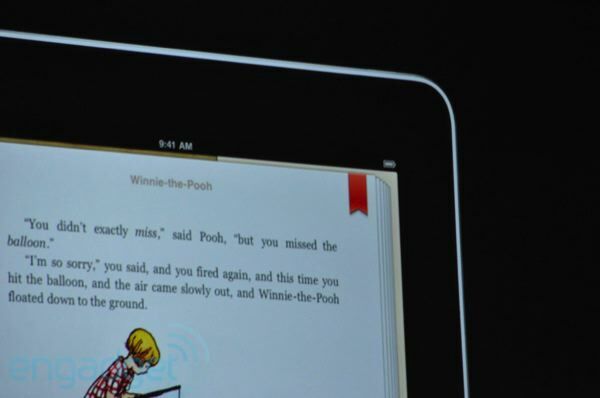 10:03AM "I want to give you some updates, and I want to start with the iPad. 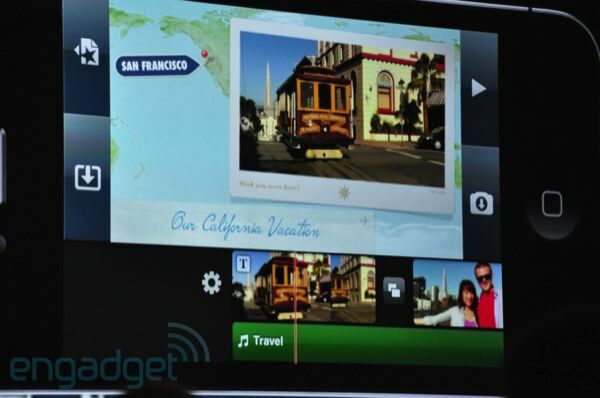 It's changing the way we experience the web, email, photos, maps, video, you name it. 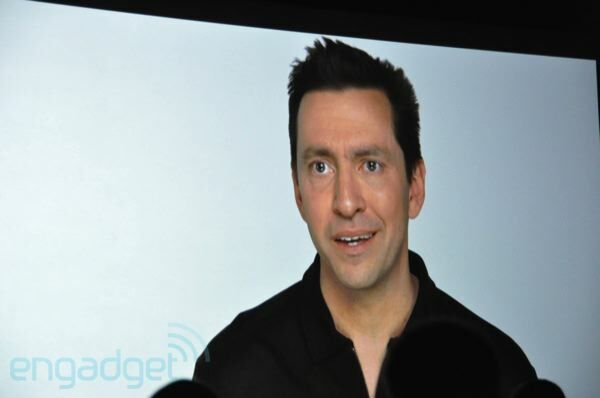 It's a whole new way to interact with the internet, apps, content and media." 10:03AM "We're excited about this year's conference and thrilled to have you here." 10:02AM "We apologize to folks who couldn't be here... this is the biggest place we can get, so... anyway." Laughs! 10:02AM "We have a great conference for you this week. 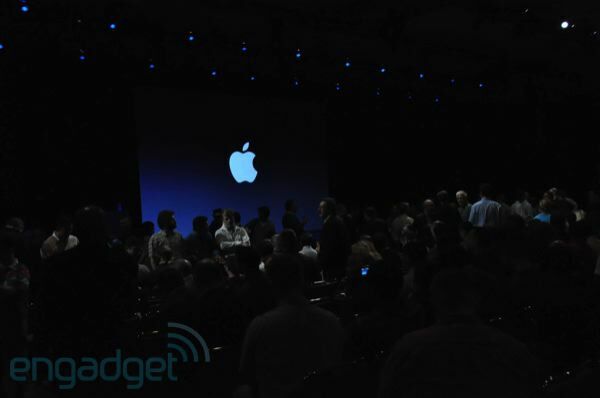 Over 5200 attendees, 57 countries, and we sold out in eight days." 10:01AM Wow, lots of flashes going off right now. "Thank you. It's great to be here. Thank you so much." 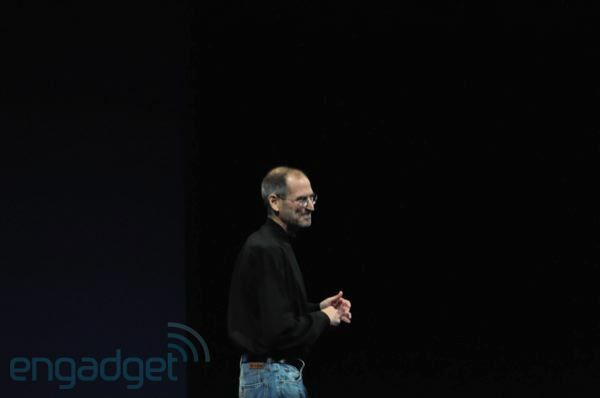 "We love you Steve!" "Thanks I think." 10:01AM Huge applause! Steve is out! 10:00AM Okay... the lights are dimming in time with the song's end. Something might be happening. Like now. 9:59AM Hmm... "What a Wonderful World" just came on. Loud. 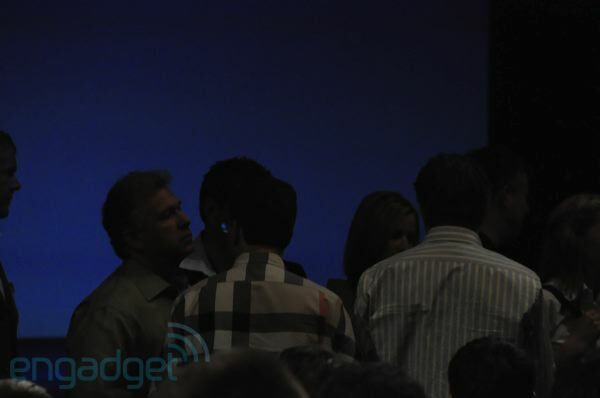 9:56AM "Welcome to WWDC 2010 -- please turn off your cellphones and PDAs." PDAs!? 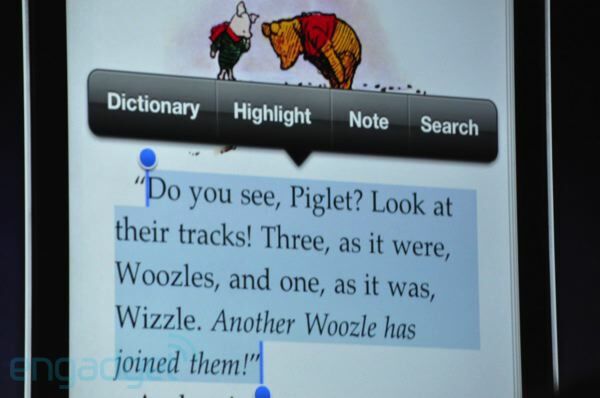 Thank you for being a friend, Apple. 9:51AM It's your last chance for predictions! Better get them in in comments before it all gets underway. 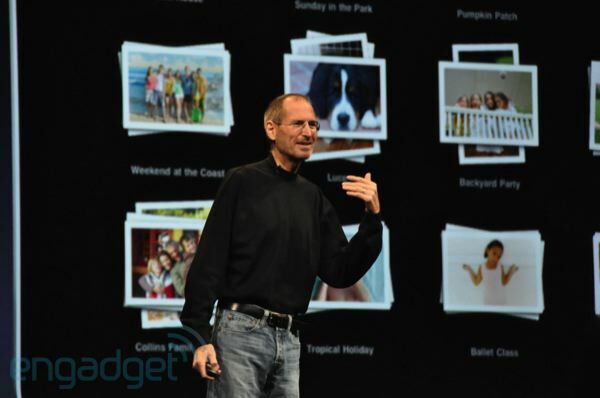 We predict there's going to be a new Mac Plus. 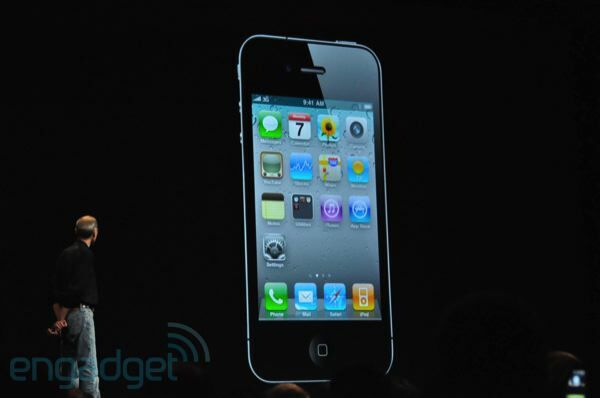 The Plus 3GS. 9:46AM The room is filling up rather quickly. Certainly the media folks have gotten settled by now, but lots of attendees are streaming in. 9:38AM Hey, if you guys want, click on that Digg badge and vote us up. No pressure, but if you don't a puppy will die. 9:37AM We think they mean to calm everyone down with this music, which makes sense since crazies were literally shoving people out of the way to get to seats. 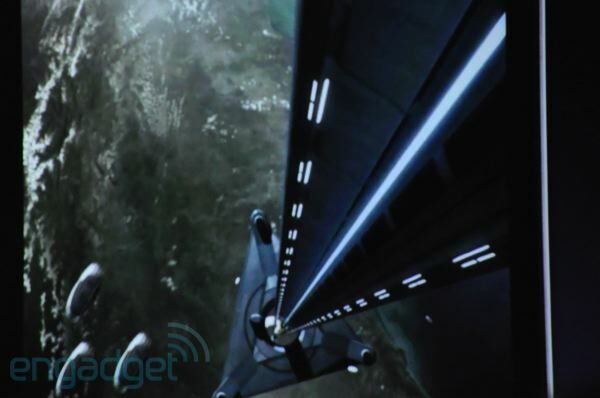 Engadget lost a tooth. 9:29AM Jazz... what could it mean? the iTrumpet? Probably. 9:29AM We're in our seats with just about a half hour to go. The vibe is pretty electric here -- but there's some smooth jazz playing on the sound system. 8:51AM We're outside the doors about to head in. There will be a stampede, and we will be crushed. So much robot news in one show. It helps a develop an infant's brain and motor skills. It's called Pix, and it's all about making people look their best. 'Playing With Power: Nintendo NES Classics' will release a week after the Classic Mini console. 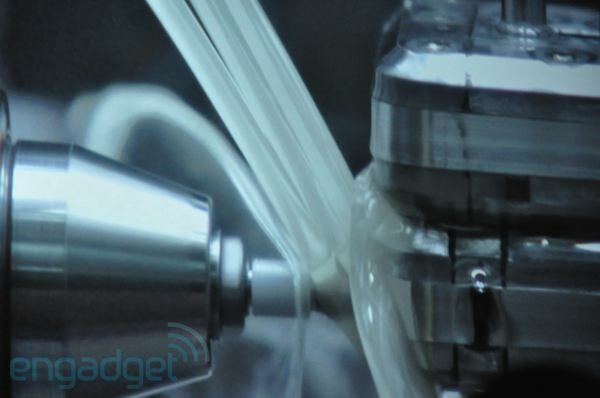 If you were concerned about your Surface Pro 3, this might come as great news. © 2016 AOL Inc. All rights reserved.